For a quick overview. Here you will find our entire portfolio in one swoop. 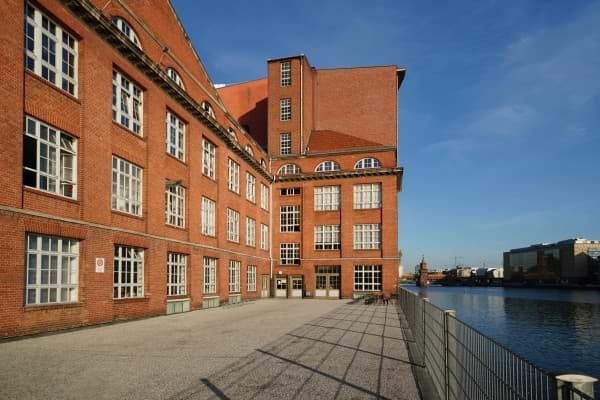 The Schlesische commercial estate is located directly on the south bank of the River Spree and the Landwehr canal, between the Oberbaum bridge and Elsen bridge in the so-called Mediaspree media and service quarter in the Kreuzberg-Friedrichshain area of the city. One of the most multifaceted cultural areas of Berlin can be found in the local vicinity: the Arena with the bathing ship. Berlin-Mitte and Potsdamer Platz can be reached in 10 minutes by car. The B96a is just 1km away, which ensures quick access to the motorway (A100) at Oberlandstraße. The Ostbahnhof train station, where Deutsche Bahn/the German Railways provides long distance travel connections, can be reached by car in 3 minutes. The Schlesisches Tor underground station is within 5 minutes walking distance. The Park Center, with shops, restaurants and a multiplex cinema, is situated in the direct vicinity of Treptower Park. There is an extensive choice of international restaurants on Schlesische Straße. Further shopping facilities can be found around Hermannplatz and Karl-Marx-Straße. 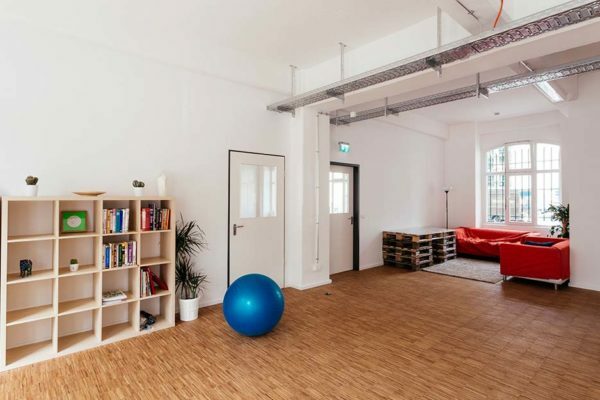 Mediaspree – The name says it all: Young, creative enterprises like the music label Universal Music or the TV Music station MTV have located on the banks of the river Spree and next to the Jannowitz, Oberbaum and Elsenbrücke bridges. 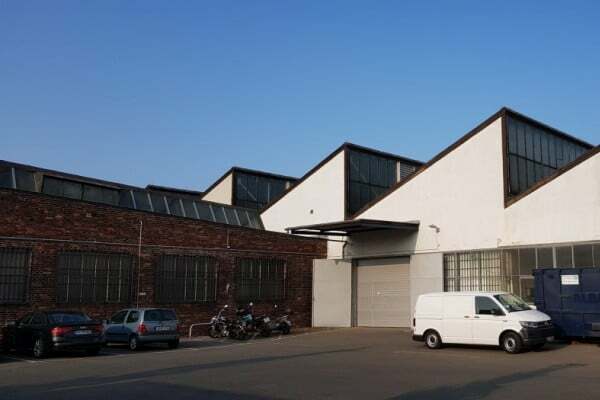 In the centre of this area – in the Schlesische Straße in Berlin Kreuzberg – you find this partly listed GSG industrial complex. Originally constructed by the Berliner Mörtelwerke in 1926/1927, the site was extended with new buildings in 1997. 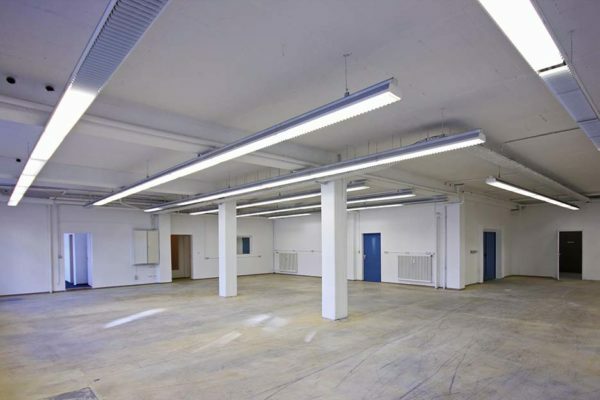 Today, the six-storied industrial complex comprises 32 rental units – with areas ranging form 207 to 860sqm, suitable for office, production or commercial purposes. The impressive view by the water attracts a colourful mixture of businesses: such as printing and woodwork as well as multimedia, design, advertising, architecture and urban planning as well as printing companies and woodcraft. For quite some time now, the big music label Universal Music, the TV music station MTV, the O2 Arena and well-known fashion labels with their showrooms have established themselves at the Mediaspree. Further creative enterprises are following, and with them cafes, restaurants and clubs. The concert promoter Arena has found its home here. And the location directly on the Spree offers numerous recreation possibilities – for example with the Arena bathing ship. Various shopping facilities can be found in the ParkCenter at the Treptower Park, at the Hermannplatz and in the Karl-Marx-Straße. The econopark is located in the Großbeerenstraße industrial area in the Tempelhof district of Berlin. In recent decades, a large number of big companies, such as Daimler, Hornbach, Otto, Reichelt, Kaiser’s, Thuermann, Thormann and Goetsch have moved to the surrounding area. The Großbeerenstraße (B101) is one of the most important North-South connections and links the A 10 Berliner Autobahnring at Ludwigsfelde/Genshagen to the southern districts Mariendorf and Tempelhof (connection to the A 100 inner city motorway). The Alt-Mariendorf underground station, underground line 6 , can be reached by bus. Furthermore the S-Bahn/urban railway line S2 is nearby and the Attilastraße and Marienfelde stations can be accessed by several bus lines (177, 277, 376). The city motorway and the airport at Berlin-Schönefeld are within a 15 minutes drive. The Großbeerenstraße, with its shopping possibilities and restaurants, is within 5 minutes walking distance. The Schlossstraße in Steglitz is 15 minutes away by car. 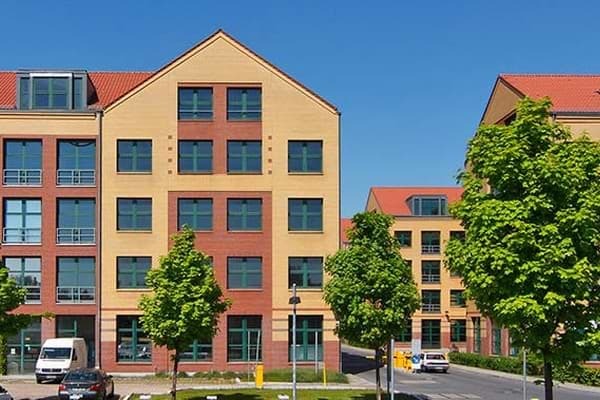 An ideal location in Tempelhof: The yellowand red brick new building complex, constructed in 1997, lies right in the centre of the industrial area Großbeerenstraße. But this is only one of the highlights that characterise this econopark in Berlin. The six three-storied buildings comprise 58 divisible commercial areas, ranging between 300 and 450 sqm – usable for offices, business premises and production areas. 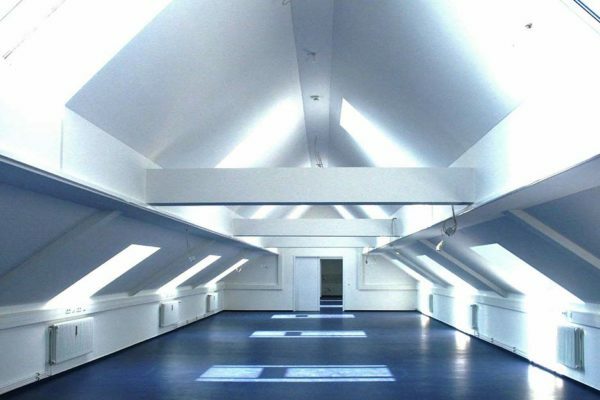 On demand, the attic can be leased additionally as storage. Small and medium-sized enterprises such as technologically innovative industrial companies, workshops and qualified service providers have settled down here – for example chip producers, manufacturers of medical equipment, a flooring company, car repair shops as well as a carbon brush factory. The nearby Großbeerenstraße is one of the most important north-south connections in Berlin. Moreover, large-scale enterprises like Daimler, Hornbach, Otto Reichelt, Kaiser’s, Thürmann, Thormann and Goetsch have settled down here. 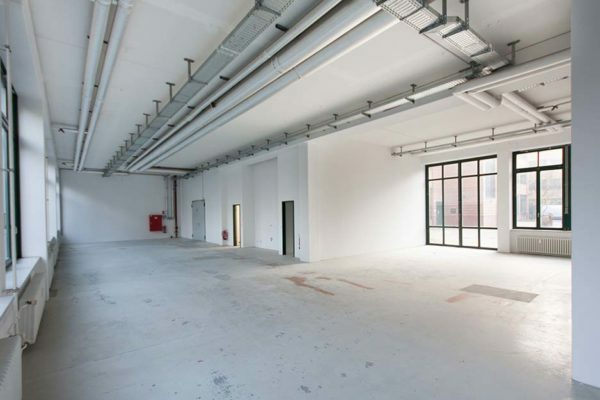 The location of this industrial complex with its commercial spaces, offices and workshops could not be better. In addition, the Großbeerenstraße offers ideal shopping possibilities. 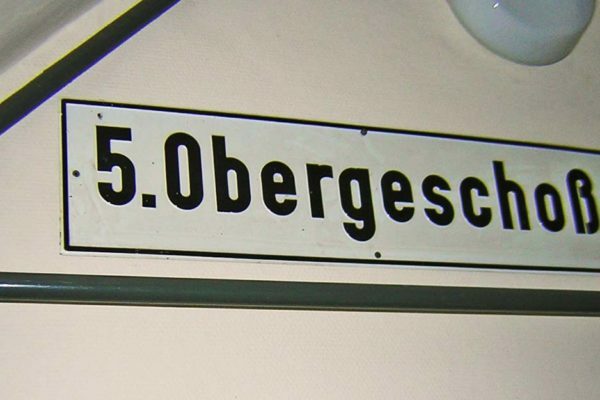 The Steglitzer Schloßstraße is not far either. If available, free spaces are displayed here. For more spaces use our property search (only available in german). 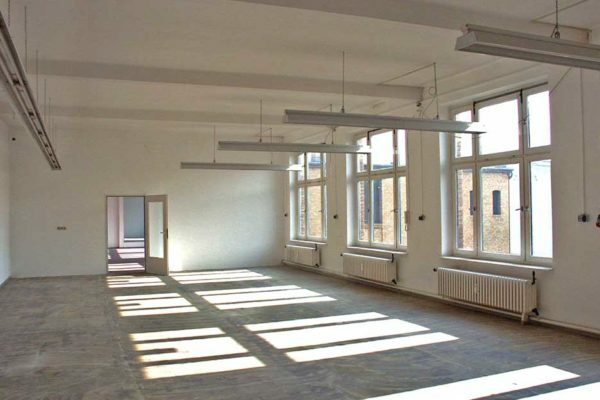 The property is located not far from the Tempelhof harbor, a site that has been developed enormously in recent years. With the underground (U6/Line 6) from the nearby Ullsteinsteinstraße underground station, Friedrichstrasse and the Stadtmitte can be reached directly within only a few minutes thus providing a fast connection to the center of Berlin. Bus number 170 stops in front of the premises. The access road to the Berlin city motorway is close by. At first, the Philips company produced record players/turntables, tape recorders and fans in the 1955 erected appliances factory in the Ullsteinstraße. 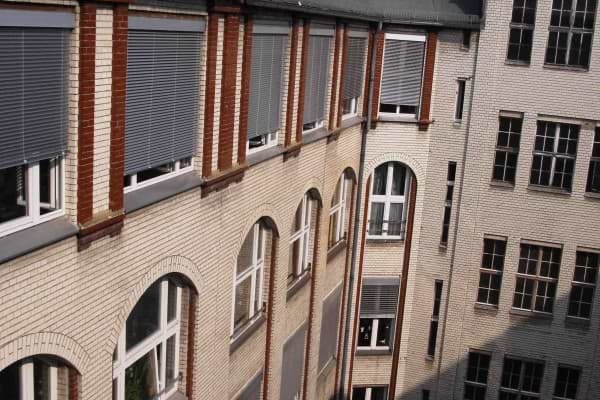 From 1985 to 1998, the textile company Brennet AG used the building for the production of its high-quality cotton fabrics. 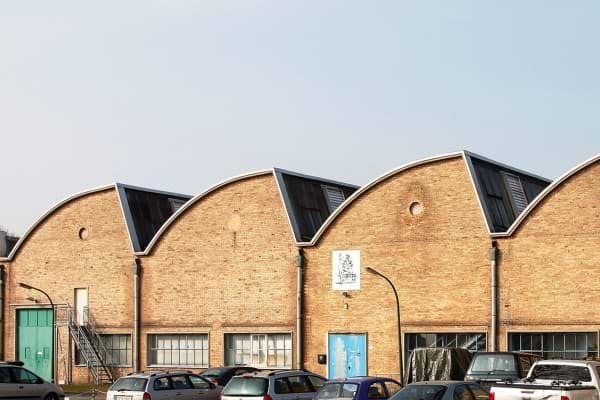 The architecturally impressive factory buildings with attached business premises were among several factories of this architectural style that were built at that time. 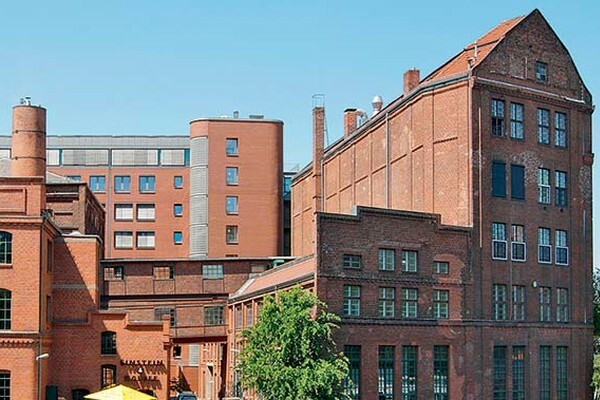 The Philips appliances factory is the oldest of its kind that has been preserved until today in its original form, except for a few extensions from the 1960s. The entire building complex is registered in the Berlin state list of historical monuments. When designing the building, Herbert Noth, Professor of Architecture, placed emphasis on functionality and design. 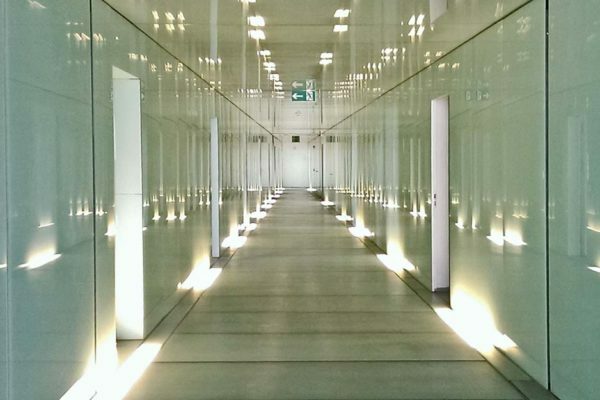 While the exterior is above all noticeable for the functional design of the building with its partially decorated clinker façade, in the interior it is the bright, friendly areas generated through the use of lots of glass. 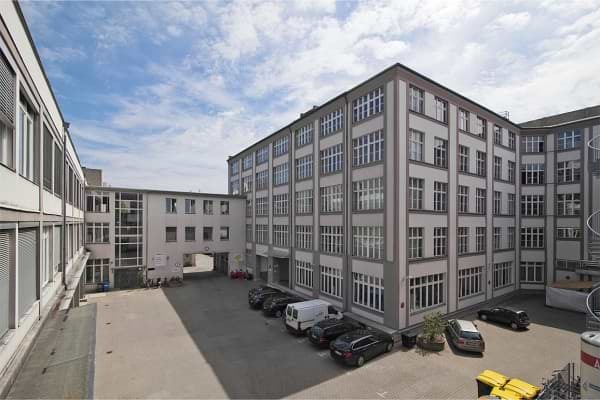 Highlight of the site is the shed hall with ceiling heights of up to 10 m. Building structure, construction, size and organization of the appliances factory represented the new beginning of the West Berlin industry. The Tempelhof harbor offers a place to linger especially in the summertime. A shopping center offers the possibility of a bite to eat or some shopping. You will also find plenty of shopping opportunities along the Tempelhofer Damm. The Geneststraße building complex is situated directly on the Sachsendamm A100 motorway slip road. The main line train station at Südkreuz/S-Bhf. Papestraße can be reached in 3 minutes on foot. Potsdamer Platz can be reached in approximately 15 minutes by car. The furniture shop Möbelhaus Höffner and Ikea Berlin-Tempelhof can be found in the immediate vicinity on the Sachsendamm/Albionstraße. New buildings and businesses can be found in the areas surrounding the new transport hub, the Südkreuz main-line train station. Furthermore, shops, restaurants and doctors surgeries are located in the Hauptstraße and Dominicusstraße. Ever since its construction, the area around the regional, intercity and S-Bahn (burban railway) station Südkreuz is extremely busy: in recent yearss, the former no-man’s land has developed into an attractive quarter with businesses of all kinds. Highlight is the direct access to the motorway A100. Originally, this complex of buildings was constructed in 1905/1908 for the Mix & Genest company, which produced electronic news equipment and letter chutes. In 1973, GSG took over and extensively renovated the five court yards of this commercial complex. In 2006, the complex was extended by a roof storey construction. 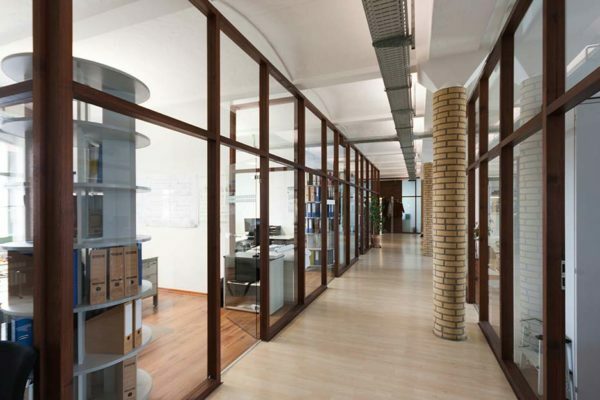 The results are 44 modern offices with generous window fronts and roons between 38 and 120 sqm. A highlight is the special features of the roof storey: it has a lino floor,overhead lighting. A total of 101 commercial units in the form of workshops, offices, industrial spaces and production facilities are located in this complex with excellent traffic connections. Furthermore, building G has a service center with reception, conference rooms and office services. 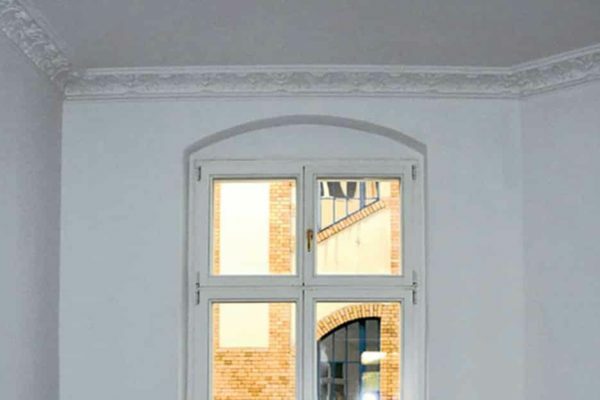 Traditional, lively, innovative – this area is on the upswing: an Ikea furnishing house and the furniture store Höffner can be found in the immediate neighbourhood at Sachsendamm in Tempelhof. To the south of Geneststraße, the industrial area Albionstraße with Berlin’s largest and most modern TÜV test station is located. The GSG-Hof Feurigstraße is centrally located in the district Schöneberg near Kaiser-Wilhelm-Platz. City East and West as well as access to inner city motorway (Sachsendamm A100) can be reached within a few minutes by car. Busses and underground stations as well as the main line and local train railway station “Südkreuz” with S-Bahn/Urban railway connections and S-Bahn Schöneberg are within walking distances. The Hauptstraße, also within walking distance, offers many shopping facilities, a post office, a shopping mall and even wellness and fitness facilities. If you follow the Akazienstraße, branching off from the Hauptsraße, you can sit down in cafes, snack bars and restaurants or meet business partners. Upscale shopping possibilities can be found in individual, elegant little shops in the Akazien-, Eisenacher Straße or Grunewaldstraße. This GSG-Hof is located in the Schöneberg district, not far from the popular Akazienstraße. 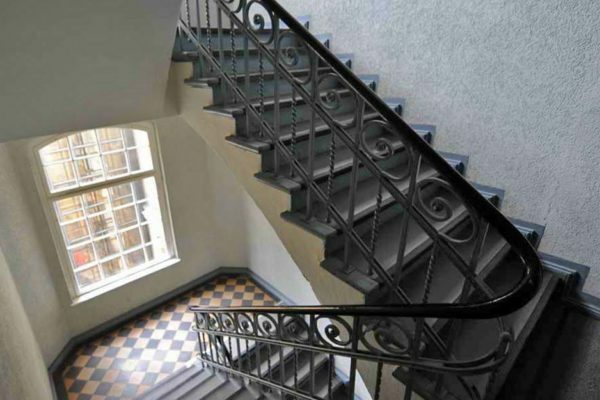 It was originally designed as a residential house, with commercial rooms at the rear, in Berlin Schöneberg in 1904. The place is currently used almost exclusively for working purposes. A variety of businesses are located in the five-storied white brick building with ample ribbon windows – typical industrial architecture of the time – and its 36 rental units. 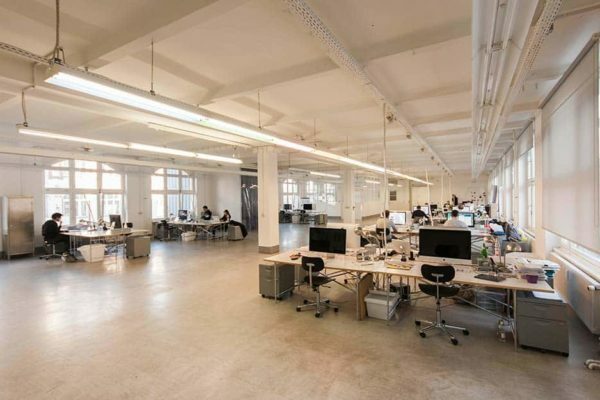 Service providers, producers and the creative industry appreciate the office areas, commercial spaces and production areas between 75 and 300 sqm. 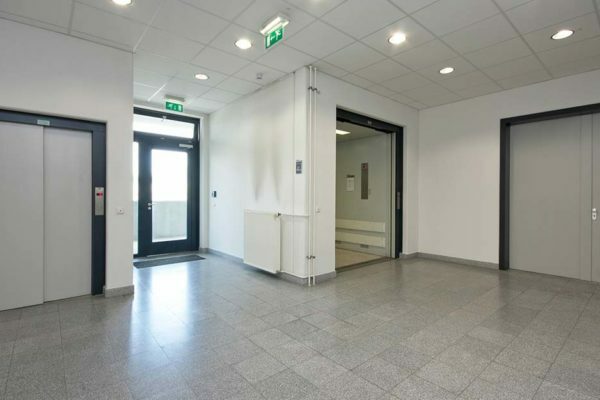 Tenants of this property will find a very lively environment: The Hauptstraße, within walking distance, offers many shopping facilities, a post office, a shopping mall and even wellness and fitness facilities. If you follow the Akazienstraße, branching off from the Hauptsraße, you can sit down in cafes, snack bars and restaurants or meet business partners. Upscale shopping possibilities can be found in individual, elegant little shops in the Akazien-, Eisenacher Straße or Grunewaldstraße. Originally, cogwheels and hardware were produced in the Saalmannstraße 7-9/Waldstraße. 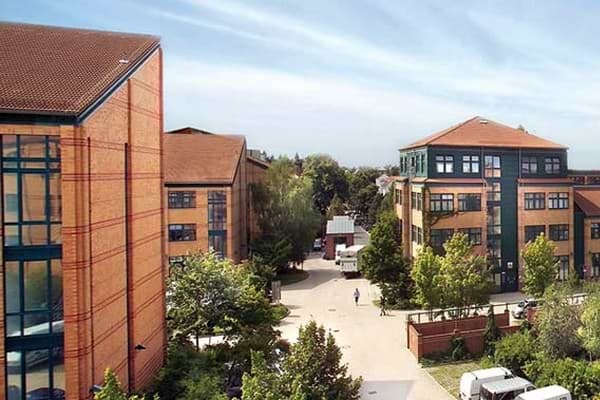 Today, small and medium sized businesses have settled in the red brick building typical for the late 19th century – an attractive complex especially for industry. 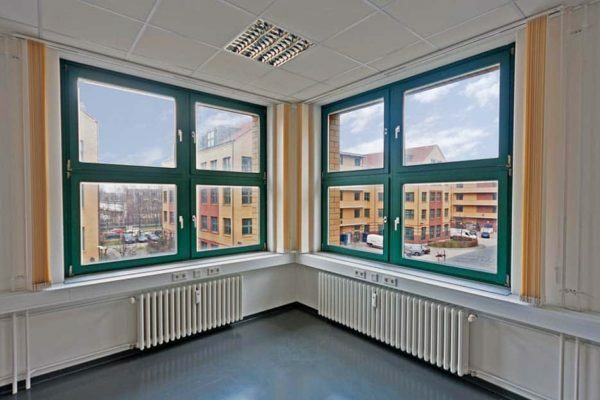 The Waldstaße commercial estate is conveniently located in the north of Berlin, next to the Karl-Bonhoeffer-Klinik. S-Bahn/urban railway station The Karl-Bonhoeffer-klinik underground-station is within 2 minutes walking distance. The west of the city can be reached within 20 minutes by car via the city motorway. The Stadtring/ring road offers easy access to surrounding areas of the city. 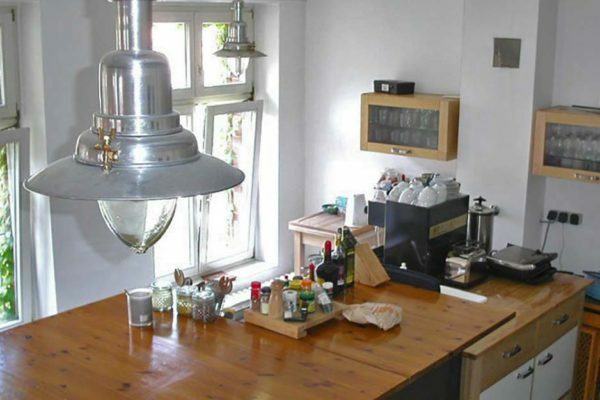 Gastronomy and shopping facilities are directly adjacent in the Wald- and Ollenhauer Straße. 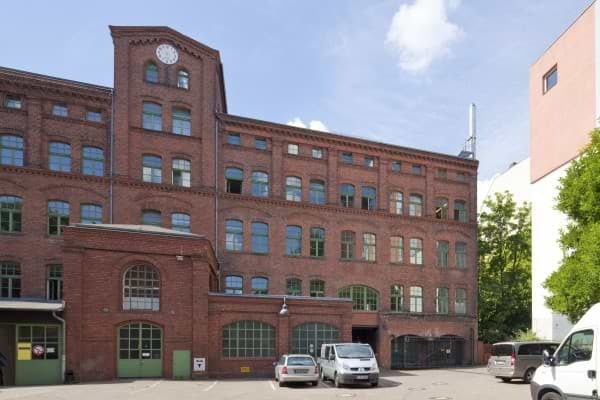 Single-story production halls and a high administration building – that were the specifications for the architect who constructed the cogwheel factory and iron foundry Friedrich Stolzenberg & Co in Berlin-Reinickendorf in 1898. After the acquisition by GSG, the whole complex was preserved as far as possible and demolished buildings were replaced with single- or two-storied new buildings in order to redesign the whole into an attractive industrial complex. Today, the complex with its historical flair includes ten buildings with 59 commercial units which offer a variety of use – from 40 sqm offices to 1,400sqm production areas. 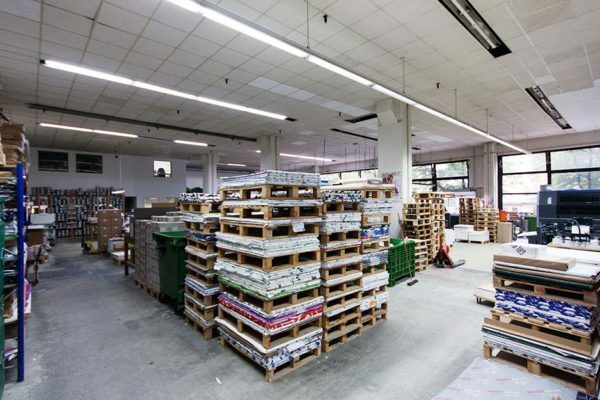 Small and medium sized businesses from the packaging, environmental and medical technology fields appreciate this complex – not least for the many ground floors that facilitate logistic processes. Shopping, eating-out and having coffee – all this can be found at the nearby Ollenhauerstraße and the Waldstraße with their gastronomy and small retail shops. The shopping center „Clou“and the hardware store at the Kurt-Schumacher-Platz are nearby as well. 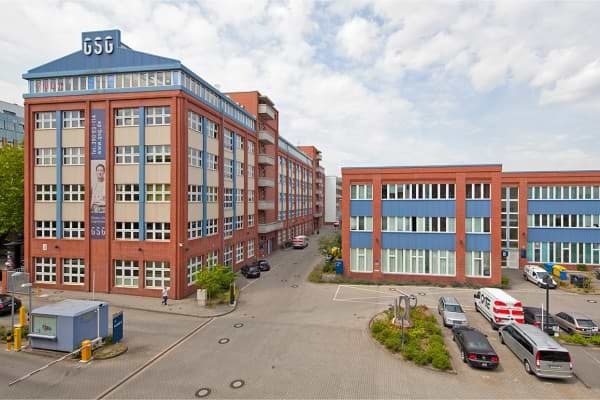 Only 2 km away from the airport Berlin – Tegel and the city motorway A 105/111 along the B96 lies the ARMO industrial estate Fleet Street. 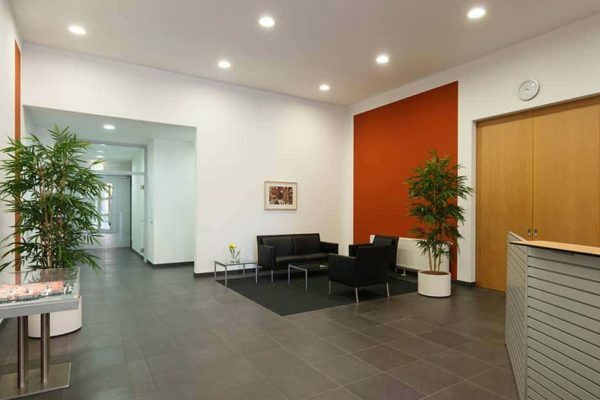 It is one of the traditional commercial areas of Berlin in central Reinickendorf. It is easy and varied to reach by public transport. 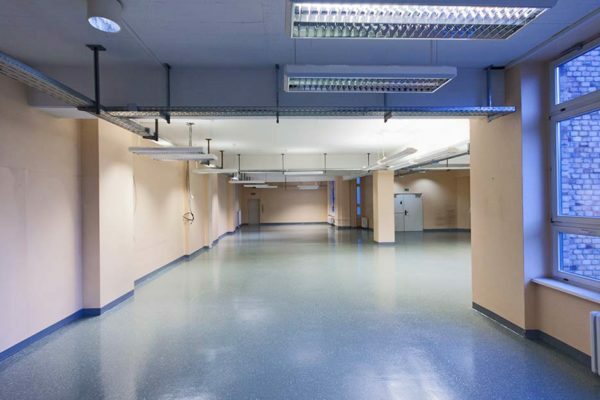 Ideally developed for customers and employees thanks to several subway and subway lines, the site offers a variety of solutions for offices, production and warehousing. 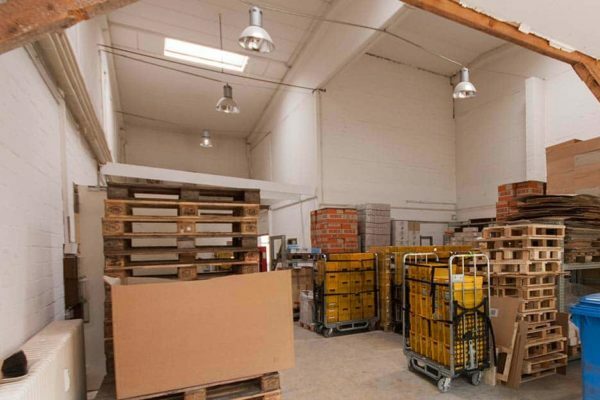 Ground-level production and storage areas represent an offer potential which, combined with the cheapest rent for decades, is the basis of their economic success for many companies. The Gewerbehof is well situated in Berlin’s Reinickendorf district. Opposite are allotments and the sports park Füchse Berlin. The GSG-Hof is situated in a quiet location; nevertheless, major traffic junctions and the city are only a short drive away. Tegel airport can be reached in roughly 15 minutes by car. The Holzhauser Straße junction to the A111 is within a 10 minute drive. The Wittenau S-Bahn/urban railway and underground station is about 5 minutes walking distance away from the GSG’s commercial property. The former automobile factory of the F. G. Dittman companywas built 1913-1914 by the Berlin industrial architect Bruno Bruch. 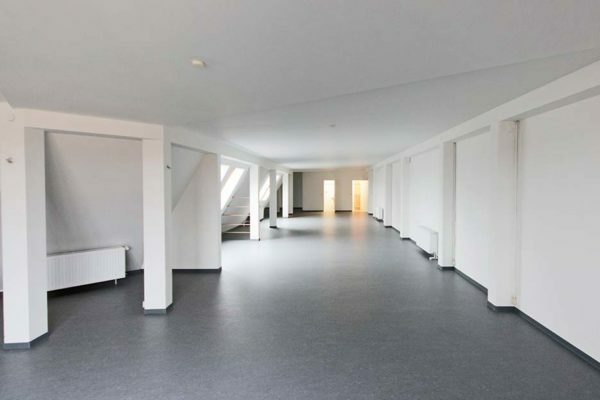 The size of the 30 rental areas varies between 40 and 2,150 square meters. A special feature of the industrial complex is the numerous ground floor areas which allow for an optimal coordination of logistic operations. Even today, the utilization profile of the industrial complex is shaped by automobile trade and repair companies, but other businesses have settled here as well. Production and trade companies find optimal conditions here, with excellent delivery and loading facilities. Service, administration and industry are uniquely united in Reinickendorf: opposite the office and commercial units and workshops are several hardware stores and one convenience store. 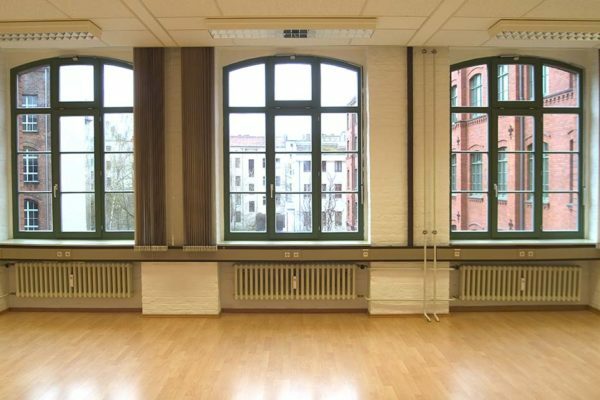 Four minutes walking distance away you will find international gastronomy and retail shops in the Eichhorster Weg, the Finterwalder Straße and the Oranienburger Straße. Important addresses such as the district, the tax and the economic office are only a few minutes away. Companies with private customers profit from the proximity to the densely populated Märkische Viertel. The econopark is situated in a sought after location in the Französisch Buchholz area of Berlin-Pankow. The site has good connections to the east of the city. The junctions to the A111 (slip road to Berliner Ring) at Bucher Straße (direction north) and/or Prenzlauer Chaussee (in the direction of the city centre) are about one kilometer away. The S-Bahn/urban railway station Blankenburg is within 8 minutes walking distance. High up in the north, in the middle of the picturesque district of Buchholz: The econopark Pankstraße is located in the district of Pankow, Berlin. In the place where leatherwear once used to be produced, a variety of businesses exist today – for example a safety engineer, manufacturers of endoscopic equipment, courier services and forwarding companies as well as music producers and work wear suppliers. 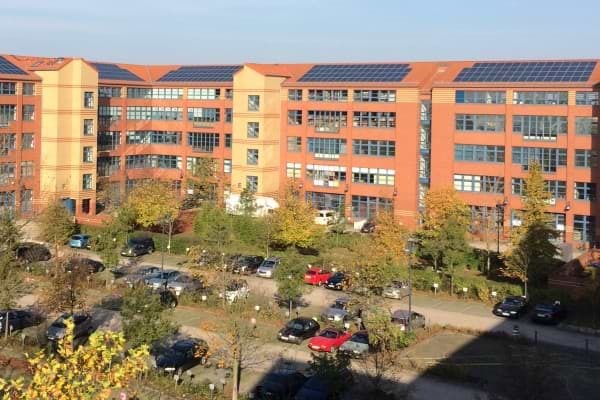 The eight striking red brick buildings comprise 221 rental units, which vary in size according to needs – from 50 sqm offices or business premises to commercial areas between 90 and 500 sqm. The econopark Pankstraße is in Französisch-Buchholz – a preferred location in the direct vicinity of a residential area. The property is an important economical centre and comprises enterprises from different business fields: services, logistics, technology, music production and clothing. Shopping facilities can be found close to the Bahnhofstraße, as well as in the Rathauscenter Pankow in the Breite Straße. The Buch hospital and emergency clinic can be reached within about 15 minutes by car. 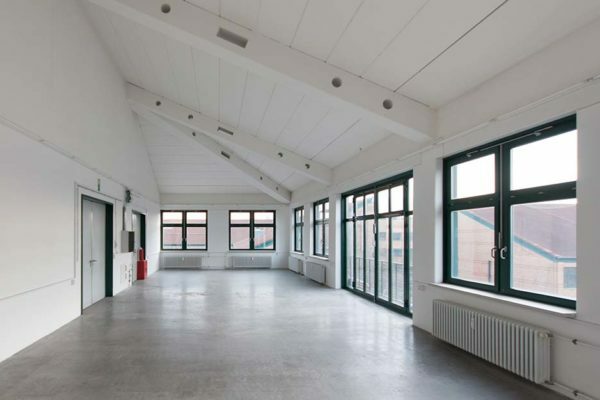 Quiet but central, this GSG-Hof was renovated in 1994 and is located in the Britz neighbourhood of the Neukölln district – one of the most important industrial areas of Berlin. The Glasower Straße is an intersecting road between Karl-Marx-Straße and Hermannstraße. 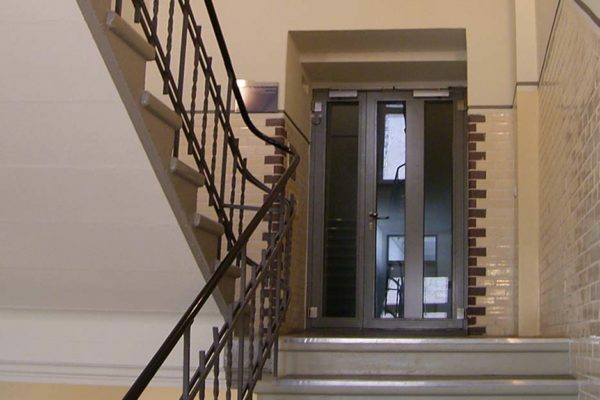 Access to the old building is possible via the Glasower Straße as well as the Juliusstraße. The metro station Grenzallee acn be reached on foot in 5 minutes, and in 10 minutes the S-Bahn/Urban railway stations Neukölln or Herrmannstraße. The A100 motorway access is about 2 minutes away. 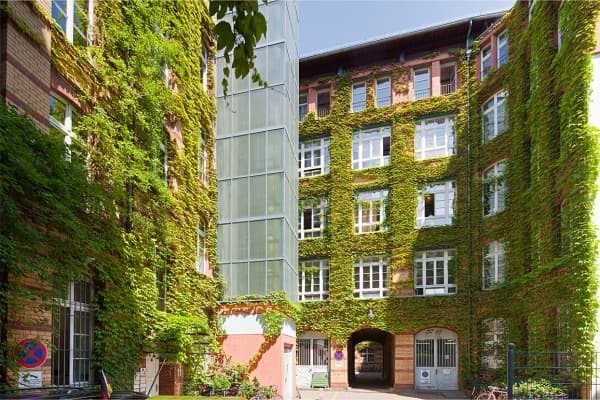 Framed with ivy and wild grape vines and surrounded by many green spaces – this light-plastered and renovated GSG-Hof in Berlin-Neukölln could not be any more idyllic. Its five-storied solitary building was constructed in 1900. Later, it was extended by an L-shaped old building, and a new saddleback building was added between 1956/1980. 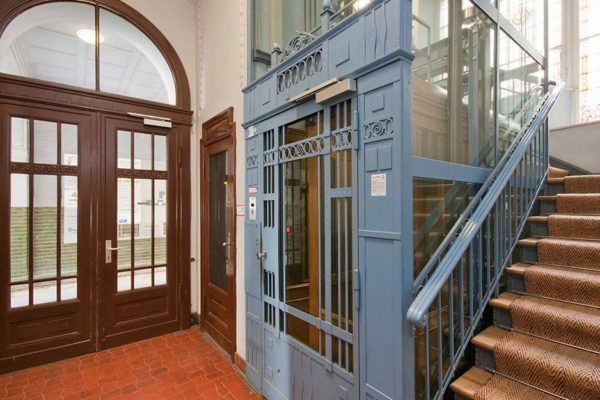 17 rental units are available in this four-storied property. The building has partial basement and the attics can be used as well. 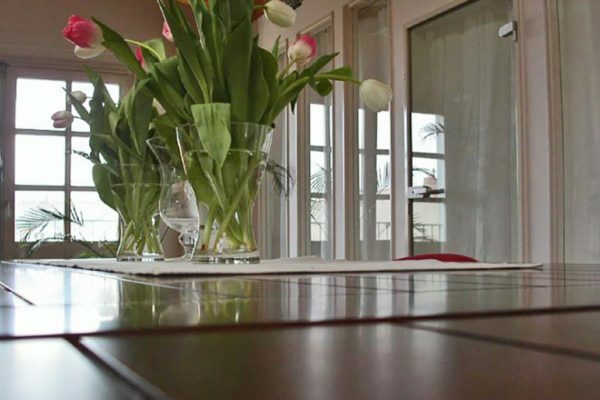 Prospective tenants can chose areas with sizes between 150 and 420sqm. An interesting industry mix of design, exhibition stand construction, media consulting, event management as well as training and further education awaits the future tenants of this commercial property, which are located here with their offices, business premises and workshops. If you are looking for a good infrastructure, you will find it in the immediate neighbourhood: shopping malls and retail stores are only some of the shopping facilities to be found directly in the Glasower Straße but also at the Hermannplatz and in the Karl-Marx-Straße, which are within walking distance. Furthermore, this district also shines with its international cafés, restaurants and snack stands. Good transport connections and its closeness to the Technology and Innovation Park Berlin (TIB) with its trend-setting disciplines science, research and latest technology – this GSG-HOF in Wattstraße in Berlin-Wedding is located in an extremely attractive neighbourhood for companies. Metro station Voltastraße and S-Bahn/Urban railway station Humboldthain are within 5 minutes walking distance. The main-line railway station Gesundbrunnen is only a few minutes away by car. There are very good shopping facilities in the Gesundbrunnen-Shopping Center at the Northern end of Brunnenstraße. Smaller supermarktes, gastronomy and snack bars can be found along Brunnenstraße. 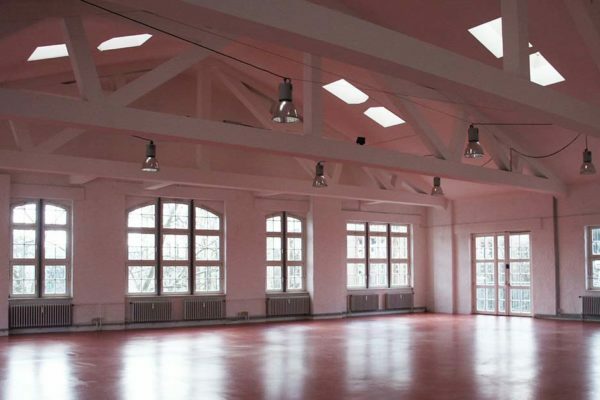 Traditional factory building with three to five stories and single-story workshops with spacious interior: those were the requirements for the buildings constructed in Berlin-Wedding by order of the foodstuffs store company Hermann Meyer AG. In the 1950s an extension was added by the architects Schwebes and Schossberger and a further extension was added in the 1990s. Today, this ensemble of buildings is a listed commercial property of GSG with a total of 40 rental units with established service providers, trades people and engineers of all kinds. 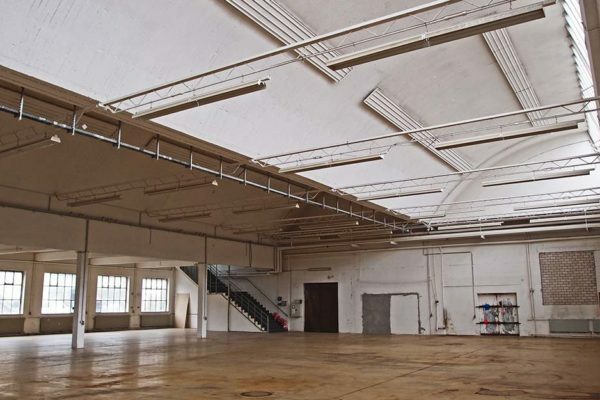 The premises with 63 to 1,050 sqm are used for a variety of purposes such as business, office or production areas as well as workshops. 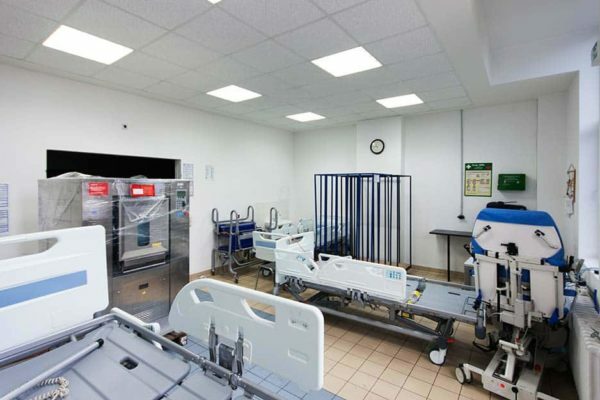 Medical technicians, carpenters, construction machinery and vending machine suppliers, wholesalers, caterer and illuminated advertisement display designers have established themselves here. Renowned companies like Deutsche-Welle-tv are located in the neighbourhood. The Gesundbrunnen-Center at the northern end of the Brunnenstraße offers good shopping possibilities, and smaller supermarkets, restaurants and snack bars can be found in this street as well. Life teems on the premises of the former AEG-Telefunken factory, today the GSG-HOF Schwedenstraße, located in the middle of the Berlin-Wedding district: tenants of this reconstructed and listed property with its distinctive brickwork can expect a neighbourhood of innovative and creative companies. The commercial asset is located in Wedding. It is reachable from the district of Berlin-Mitte within 15 min. via Rosenthaler Straße, Bad- and Brunnenstraße. Airport Tegel and motorway access A100 (Seestraße) are 10 minutes away by car. Metro station Osloer Straße with metrolines U8 (Wittenau-Hermannstraße) and U9 (Rathaus Steglitz – Osloer Straße) are close by. Numerous bus routes are also available (125, 128, 150, 250). After only one minute walk you reach the tramline 50 (Virchow-Klinikum – Guyotstraße) and die Metro Tramline M13 (Virchow-Klinikum – S+U Bhf/Urban rail and metro staion Warschauer Straße). Retailers, supermarkets and International gastronomy are to be found in the Osloer Straße and the Schwedenstraße. A Kaufland-shop is on the neighboring plot of land. The Gesundbrunnen shopping center offers further shopping facilities. Where once electro technical equipment of the AEG-Telefunken was produced now stands the GSG-HOF. The six-storied factory building with the red clinker facade was built between 1939 and 1942 in Berlin-Wedding. In the 50ies, single-storied extensions for vehicle halls and storage buildings were added. 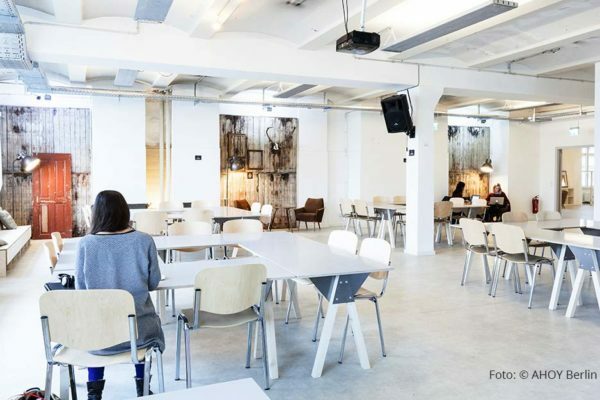 Today, a diversity of businesses typical for Berlin livens up the rooms of the erstwhile factory which has been since renovated and listed: creative people who turned art and dance into a business work door to door with companies successful in production, services and trade. 72 commercial units are ready and waiting for tenants in the improved building. 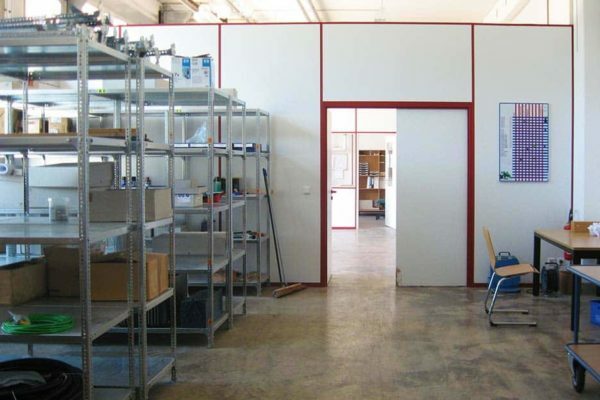 The multifunctional, available units between 60 and 1,000 square meters are suitable for a wide variety of uses such as office or commercial areas, workshop or production facilities. 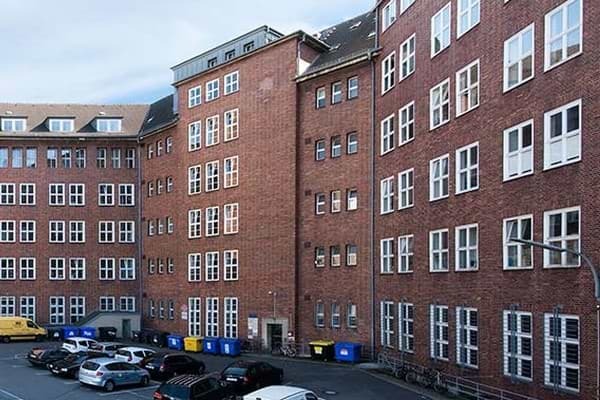 The area around the commercial property has an interesting infrastructure to offer: There are a number of retail stores, international restaurants and bistros as well as supermarkets to be found in this street and in the Osloer Straße. Further shopping facilities are located at the Gesundbrunnen center. 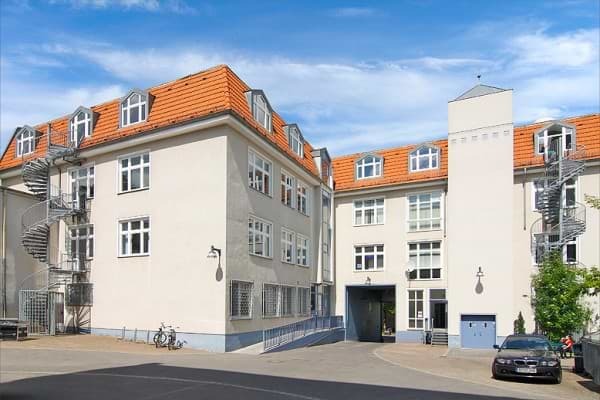 A charming environment awaits tenants in Reuchlinstraße, located between Huttenstraße and Kaiserin-Augusta-Allee: for one thing, there is the river Spree, which winds its way right past the GSG-Hof with its eight new and old buildings. For another, the many shops liven-up the area around Turmstraße and Kaiserin-Augusta-Allee, from which one can access the complex. 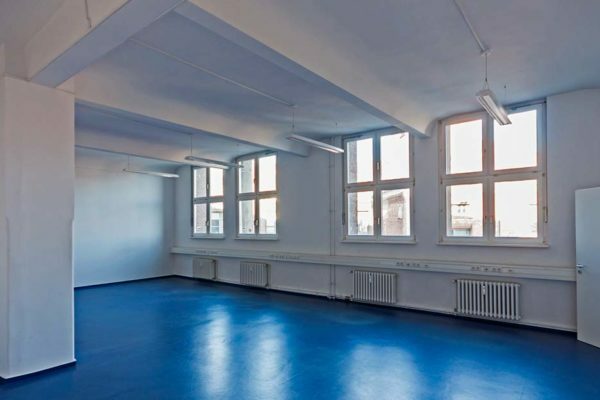 The commercial property is conveniently placed in terms of transport, at an inner city location in the Moabit area of Berlin-Mitte. The site can be accessed via Kaiserin-Augusta-Allee 10-11. On both sides of the River Spree, new office buildings surround the Reuchlinstraße commercial property. Numerous shopping facilities and international restaurants can be found around the Turmstraße underground station The Zoological gardens and Kurfürstendamm can be reached in 8 minutes by car. The Turmstraße/Beusselstraße bus junction is within roughly two minutes walking distance. The Beusselstraße (A100) motorway slip road can be reached in 5 minutes by car and Tegel Airport is 10 minutes away. 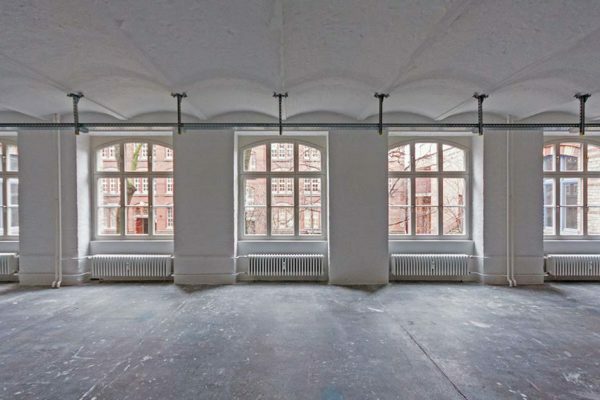 Gas lamps and machines were once produced in these buildings of the Pintsch-Bamag (Berlin-Anhaltische Maschinen AG) which were constructed between 1910 and 1923. 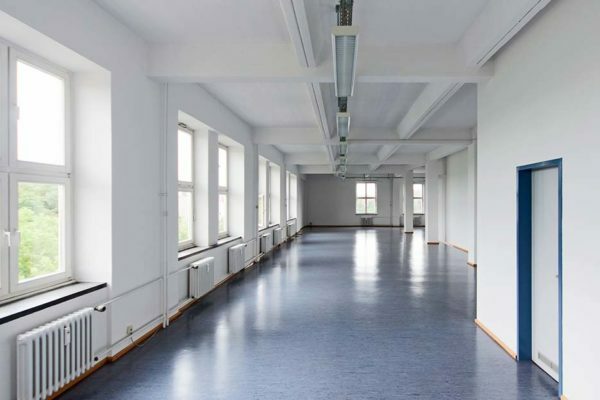 Later, the Herlitz AG took over the property in Berlin-Tiergarten in order to set up their first high bay warehouse for stationery. 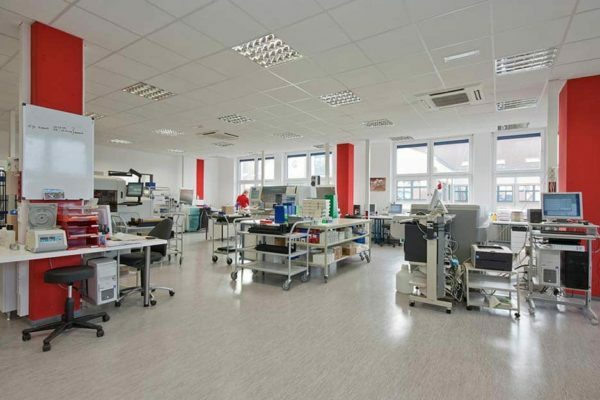 Today, printing plants, companies from the automotive industry and automation technology have set up business in the GSG-Hof Reuchlinstraße because they value the combination of modern offices and production facilities. The successful blend of architectural styles of eight old and new buildings with up to five stories offers a choice of commercial spaces ranging from 40 to 800sqm in size. 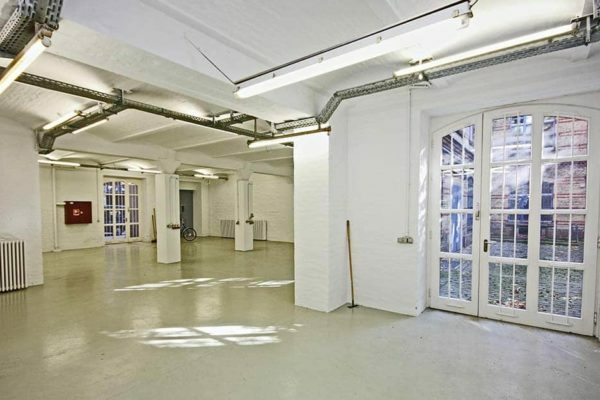 The rental spaces can be used as offices, businesses, for commercial purposes or production. 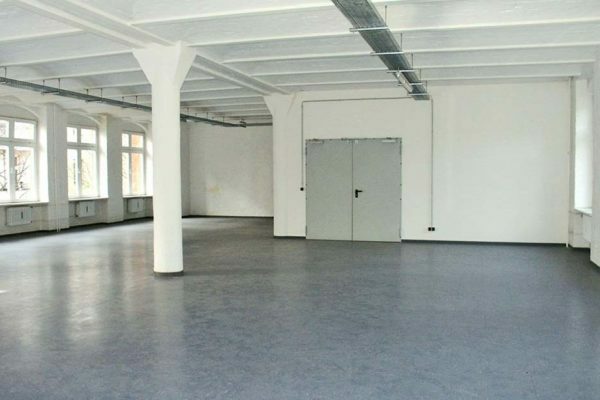 New business founders are welcome: this industrial complex offers ideal conditions for start-ups. 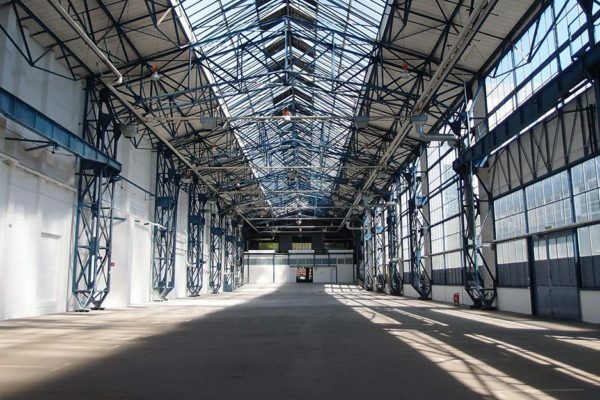 This industrial complex is home to multimedia companies, architects, carpenters, electronics companies and event technology. On both sides of the Spree, a number of office buildings have been erected. A variety of shopping facilities and international gastronomy can be found around the nearby underground station Turmstraße. The Technology and Innovation Park Berlin (TIB) is centrally located. The complex is surrounded by Brunnenstraße, Voltastraße, Hussitenstraße and Gustav-Meyer-Allee. Metrostation Voltastraße and Tramway-Station Humboldthain are within 5 minutes walking distance. The railway station Gesundbrunnen is only a few minutes away by car. There are very good shopping facilities at the Gesundbrunnen-Shopping-Center at the Northern end of Brunnenstraße. Smaller supermarktes, gastronomy and snack bars can be found along Brunnenstraße. 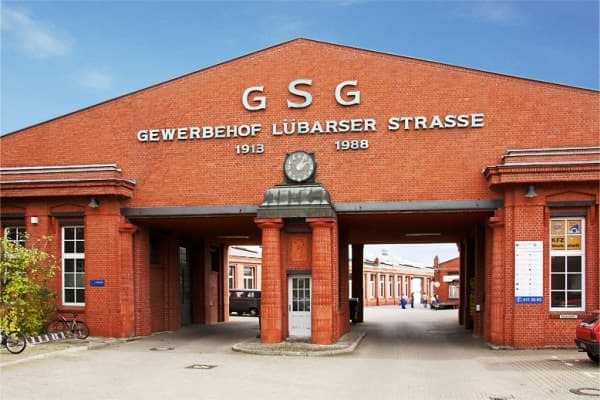 Its huge halls and factory buildings make this second largest industrial complex of GSG one of the most important and impressive production plants in Berlin. There is a good reason why it is a listed complex. Around 1900, AEG implemented the first test tunnel for underground railways. 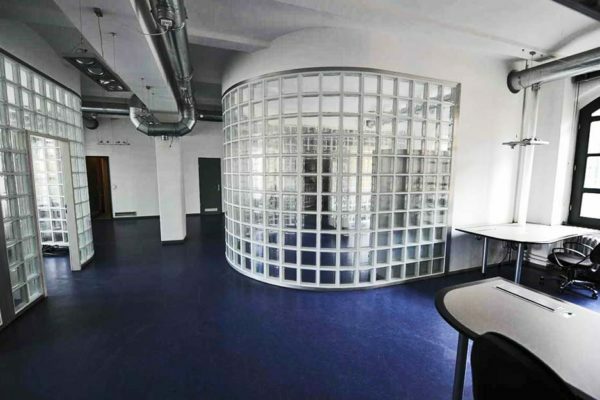 Today, similiar innovations are being worked on in the complex that was constructed between 1895 and 1941 in the district of Berlin-Mitte, near Prenzlauer Berg. The buildings were constructed by AEG for manufacturing purposes. The twelve buildings were renovated after GSG took them over in 1985. This striking property does not only stand out with its Wilhelminian style facade. It has a very interesting interior, as well: attractive and modern office and commercial areas as well as production facilities of 30 to more than 1,000 sqm are available in the 100,000 sqm facility. Two of the special features of this industrial complex are the “Technology and Innovations Park Berlin” (TIB), which was founded in 1985 by the Berlin Senate and the Technical University, and the „Berliner Innovations- und Gründerzentrum“ (BIG)/ “Innovations and Founders Center Berlin”: institutions that offer ideal starting conditions for companies with innovative and talent-oriented ideas. Additionally, you will find GSG’s first e-charging station, opened in 2011. It is fed with energy produced by our own photovoltaic-system installed on the roof. 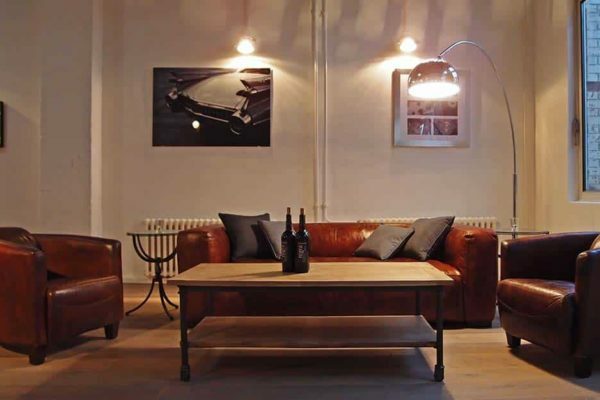 Thus tenants can charge their e-cars and e-bikes directly onsite at very reasonable prices. Since the mid-80’s, companies from the fields of science, research and high-tech have been profitable on this industrial site. 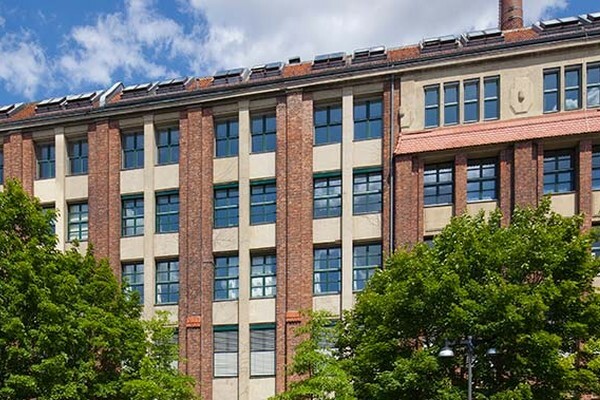 Germany’s first founder center, the ” Berliner Innovations- und Gründerzentrum“ (BIG I)/ “Innovations and Founder Center Berlin” opened in 1983 under the leadership of the Technical University in the neighbouring Ackerstraße. An addition to the successful BIG I, the BIG II was built in 1985 within the „Technologie- und Innovationspark Berlin“ (TIB) / the “technology and Innovations Park Berlin”. Apart from the BIG and TIB, a number of research facilities can be found on the premises – about 14 institutes of the Technical University Berlin and the IZM of the Fraunhofer Gellschaft / The Fraunhofer Institute for Reliability and Microintegration IZM. 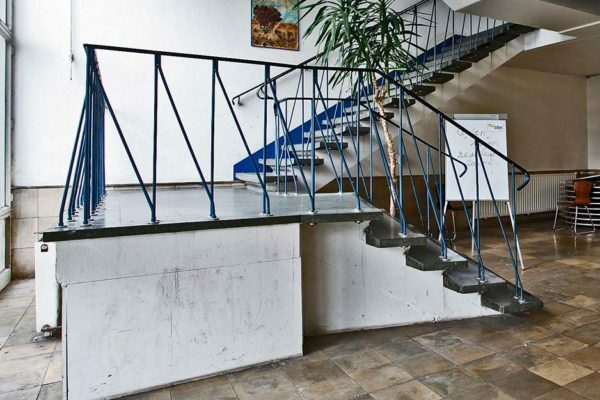 An attractive environment, a quiet atmosphere and interesting partners in the vicinity – the econopark Wolfener Straße is located in the metropolis area Berlin Eastside in the district Marzahn, the biggest connected industrial complex of the capital. The econopark Wolfener Straße has direct access to the S-Bahn/suburban railway perfectly connecting the location with the innercity. 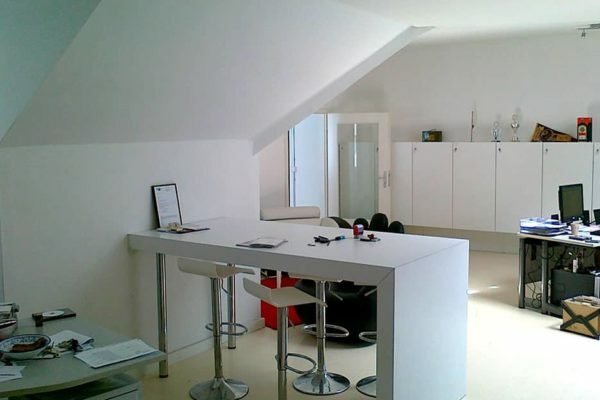 It is conveniently situated close to the Mehrower Allee in Berlin-Marzahn. The east of the city can be reached within 20 minutes by car via Bitterfelder Straße, Maerkische Allee and Landsberger Allee. The motorway connection to the Berliner Ring road is about 7 km away. Direct access to the Mehrower Allee S-Bahn/urban railway station (S7 Potsdam – Ahrensfelde, via Friedrichstraße and Bahnhof Zoo). Roughly 200m away there is the bus junction with connections to Köpenick, Hohenschönhausen and Hellersdorf. Retail companies and service providers are situated in the surrounding neighbourhoods. The shopping centre on Mehrower Allee is within a few minutes walking distance. Various shopping facilities and restaurants can also be found on the Marzahner Promenade and in EASTGATE BERLIN. Modern offices and commercial units, grouped around a green patio with a pond in the middle – and at the same time right in the centre of the metropolis area Berlin Eastside, vis-á-vis des Cleantech-Businessparks: The industrial complex econopark Wolfener Straße, constructed between 1995 and 1997, the biggest property of GSG, offers tenants best working conditions in a very relaxed atmosphere. 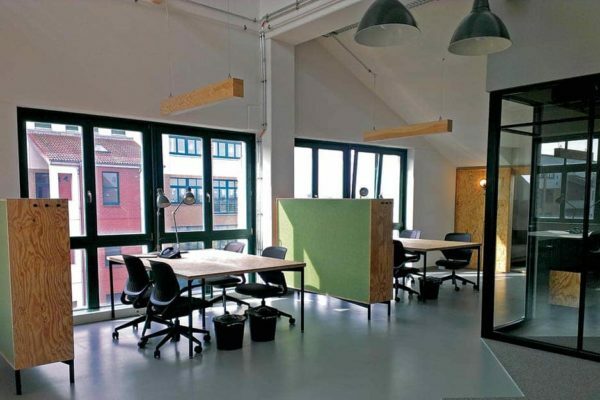 Startups will find ideal conditions for starting their own businesses: The service centre on-site offers a central reception as well as a wide range of office services and conference rooms. A mixture of businesses has located in the 26 buildings with their 575 rental units, comprising among others carpenters, locksmiths, electricians, computer firms as well as high-tech companies. 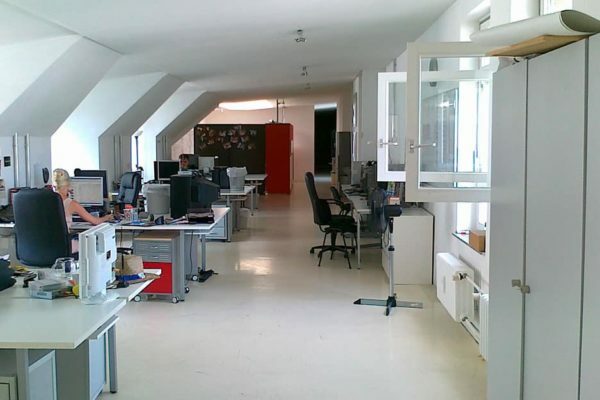 The spaces are quite different: small offices from 14sqm or ample office lofts, business spaces, production areas and workshops ranging from 150 to 700sqm. 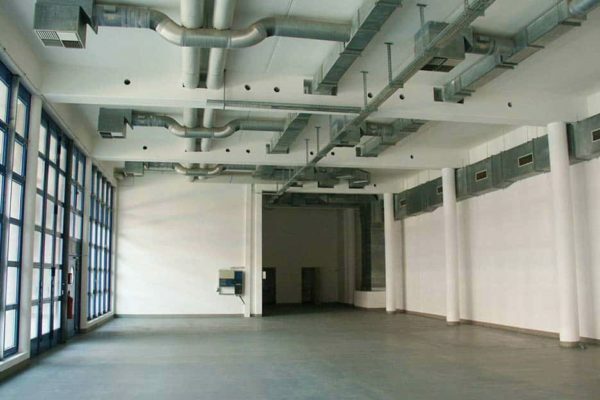 It is also possible to combine units up to 5,000sqm. Niles Werkzeugmaschinen GmbH, Faga Fahrzeugausrüstung, Berlin Cosmetics GmbH & Co. KG, Harry Brot Betrieb Berlin, Inventux, Berliner Werkzeugmaschinenfabrik GmbH as well as Computer Wholesale. These are just some of the big companies located around the econopark. And the infrastructure is impressive, as well: There are excellent shopping facilities in the nearby shopping centre Mehrower Allee. You can reach the Eastgate by car within seven minutes. The econopark Berlin-Hellersdorf is situated at an easily accessible location. Good connections to the city centre in 20 minutes by car via Landsberger Allee/ Landsberger Chaussee, and to the surrounding area, via the Berliner Ring. In the surrounding area of the econopark are residential areas with shops and service enterprises, as well as sports and recreational facilities. The “Atrium-Hotel”, the medical centre and rescue centre, the shopping and cultural centre “Helle Mitte”, which is the official residence of the district office of Marzahn-Hellersdorf, as well as numerous shopping facilities, indoor-climbing and restaurants, are all located two tram stops away (M6, M18) at the Hellersdorf/ Alice-Salomon-Platz. 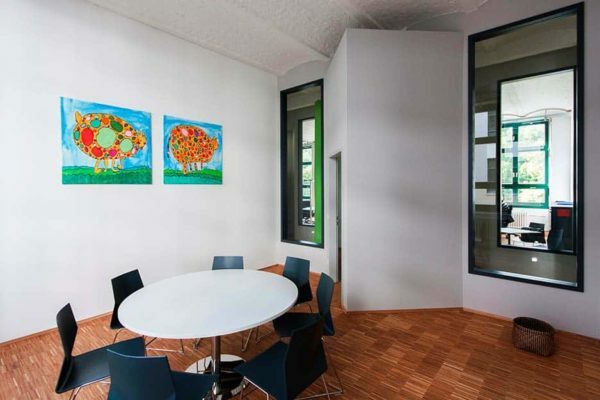 Living and working – this can be perfectly combined at the GSG-HOF. The econopark, which was constructed in 1999, is quiet and idyllically located on the outskirts of Berlin, but has good transport connections nevertheless. With its crescent-shaped arrangement of four-storied and light-coloured buildings, this property harmonically blends with its environment. 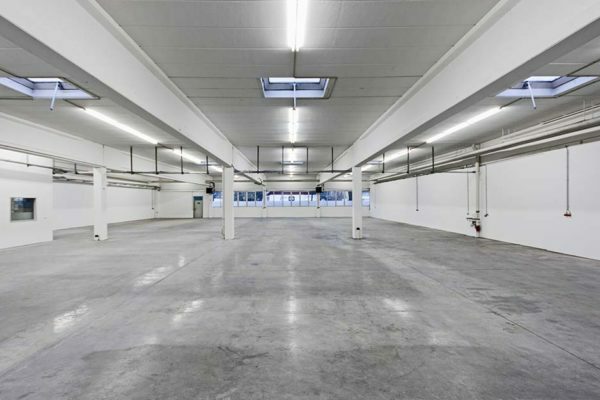 Whether as office, storage, production facility, workshop or commercial rooms – the 147 rental spaces are individually usable. 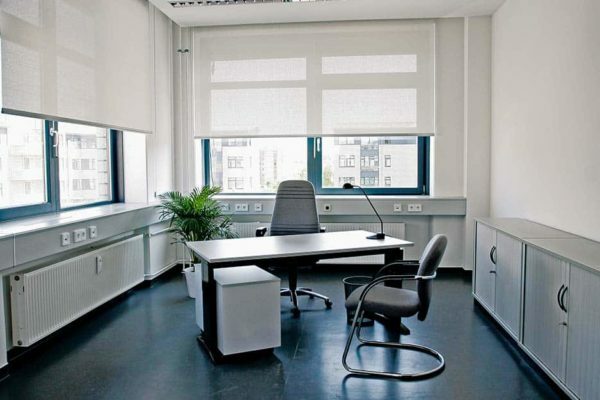 Offices begin at 20 square meters; commercial space has between 120 and 380 square meters. A highlight is the leisure area with seats and a habitat that can be used by all tenants. 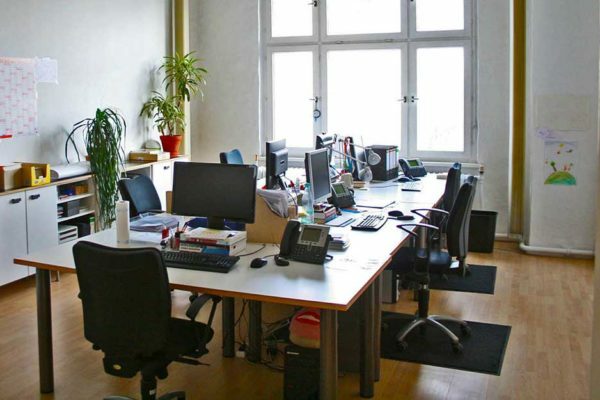 The tenants can expect to find a wide variety of industries, ranging from EDV service providers, rehabilitation and medical technologies, dental laboratory, construction, and janitorial services, repair service for electrical equipment, publisher, flower shop, architecture and engineering offices, advertising agencies and nursing care. 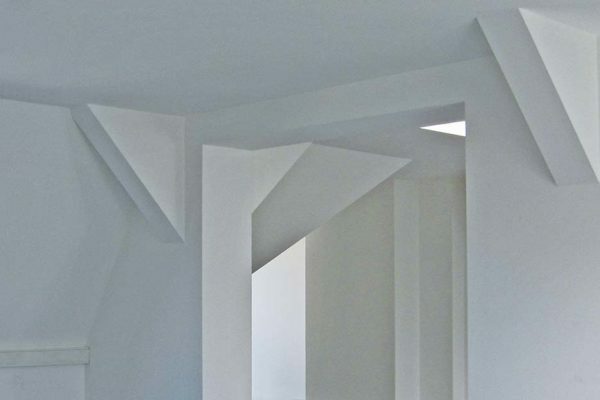 This property is harmonically embedded in a residential area. Only two tram stops away is the district center “Helle Mitte” with many shopping facilities, catering, a diversity of service facilities as well as public authorities. Sports and recreation establishments offer relaxing moments. Berlin Eastside, the biggest connected commercial area: Situated in the triangle between Plauener Straße, Marzahner Straße and Rhinstraße, this econopark in Berlin-Lichtenberg, completed in 1998, offers a lively environment in 13 buildings with more than 80,000 sqm – for business, trade and service. Stops of the M17 and M27 tramlines are located directly in front of the commercial estate. The city centre at Alexanderplatz can be reached with a journey time of approximately 20 minutes. The Berliner Ring can be reached in roughly 15 minutes by car, via the Hellersdorf motorway slip road. 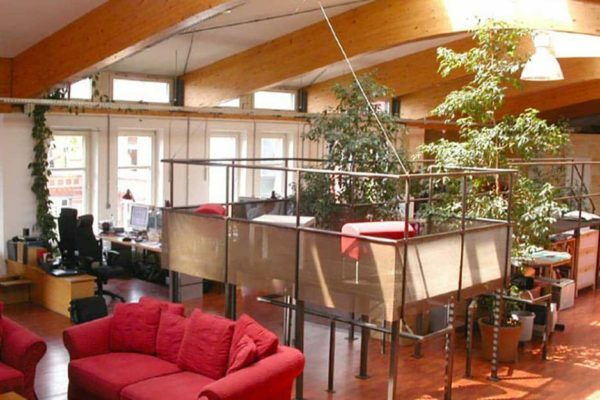 Ideal working conditions, good travel connections to the centre and to the surrounding area and on top of this prominent architecture: This econopark in Berlin-Lichtenberg is an excellent address. 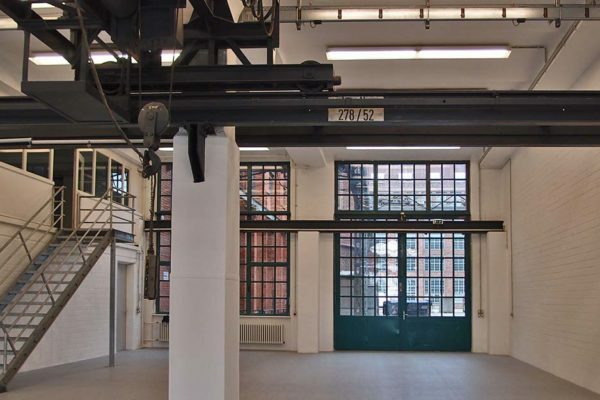 The property, constructed in 1998, comprises a total of 13 buildings with brick fronts – a conscious reminiscence of the industrial architecture of the 20s. 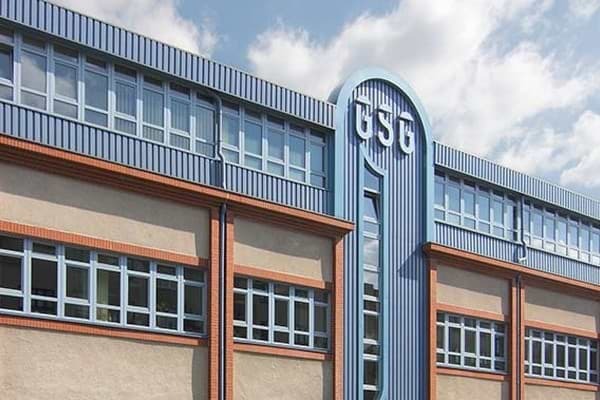 For reviving this industrial complex, GSG was awarded the Bauherrenpreis -builders prize – 2000. 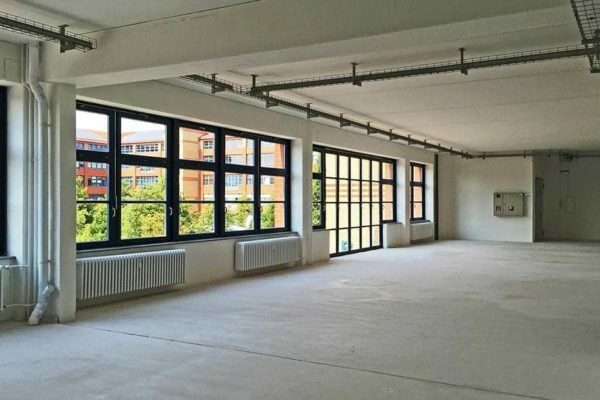 This site offers about 500 rental units – offices of 16sqm, multifunctional commercial space or production areas between 90 and 340sqm. 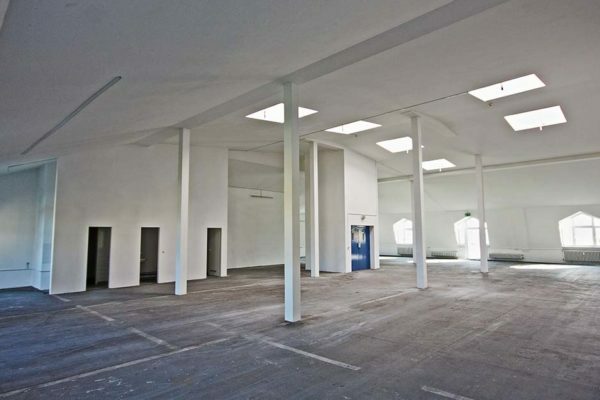 Tenants will find a lively environment for business, trade and service. A green circular flower bed with benches in the court yard is available for recreational use at lunch time. Very different businesses have settled down on this site – online-platforms, carpenters, locksmiths, architects, physiotherapists, car repair shops, a trade company as well as a mail-order pharmacy. This interesting, inspiring mixture makes this area an ideal site for commerce, offices and work shops. An attractive site in Berlin: Quiet and central at the same time, surrounded by the best infrastructure – including the Kreuzberg atmosphere. 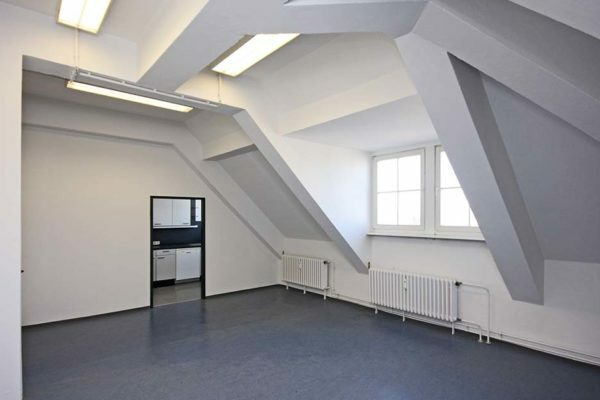 This GSG-HOF is located close to the popular Bergmannstraße, right in the residential area Chamissoplatz. The distance to the Bundesstraße 96 via Mehringdamm (access to the ring road A100) is approximately 800 m. The site is located within walking distance to the subway stations Gneisenaustraße (U7) and Hallesches Tor (U1, U6). In the nearby Gneisenau and Blücherstraße you will find many bus lines. In the market hall at Marheinekeplatz there is everything for your daily needs. International cuisine can be found around the famous neighborhood of Bergmannstraße and Gneisenaustraße. Practitioners are located around the Gneisenaustraße. 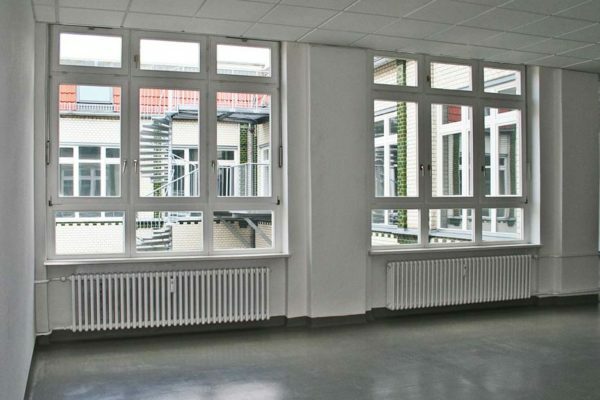 The Urban Hospital in the Dieffenbachstraße is approximately 10 minutes drive away. 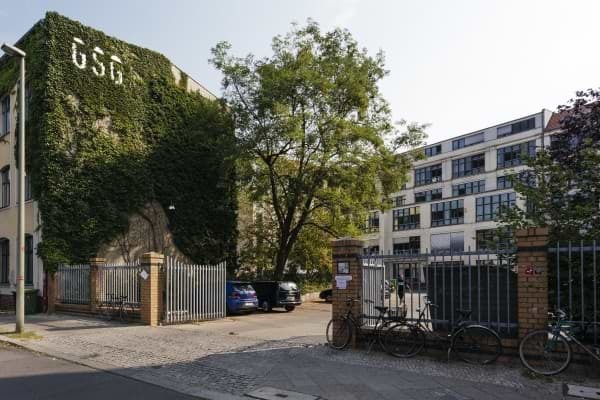 In former times, fragrant soaps were produced here – nowadays, creative people, consultants and craftsmen have located here: In 1905, the soap producer Rudolf Herrmann had an industrial building constructed in Berlin Kreuzberg. 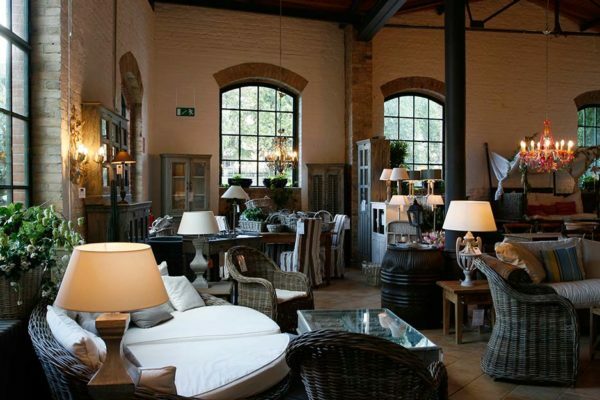 In 1911, the trading company Hentschel & Co. joined the site with their representative office. 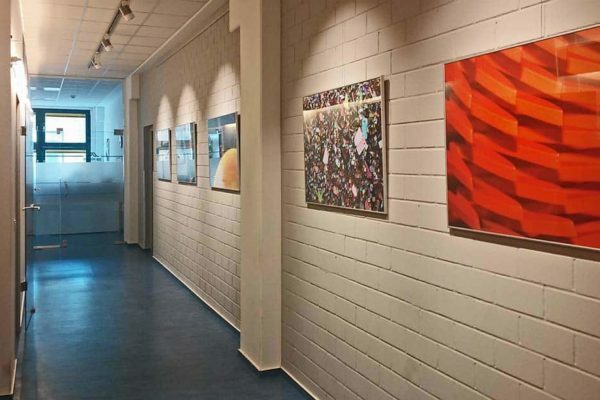 Today, printing plants, lawyers, architects, visual artists, designers and photographers have located in the GSG-HOF close to the popular Bergmannstraße. In a typical four- to five-storied reinforced concrete building, there are 100 commercial units, usable as business spaces, offices and production areas. 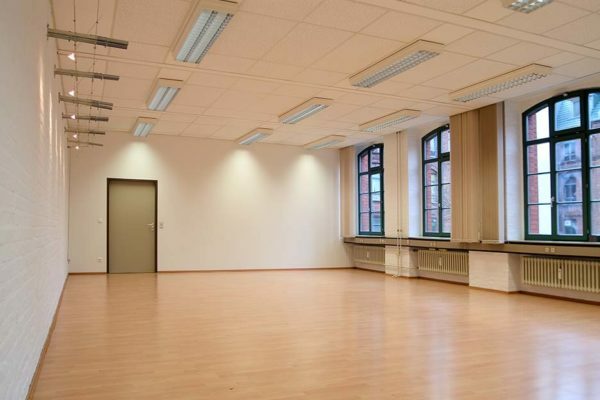 According to requirements, areas ranging from 30 to 500 sqm can be rented. The district around the Bergmannstraße and the Gneisenaustraße is bursting with life: At the Marheinekeplatz, the market hall of the same name provides you with everything you need for daily life. Furthermore, tenants will find international gastronomy – for lunch breaks, a quick coffee, a meeting with clients or business partners. Where tradition and trend live side by side: right around the corner Kreuzberg vibrates with life – unique and authentic. 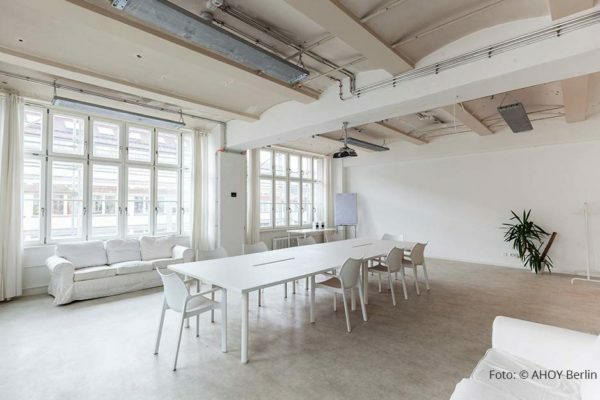 In the listed GSG-Hof from 1865, however, you can conduct business in a quiet atmosphere without having to give up the busy goings-on in Oranienstraße. 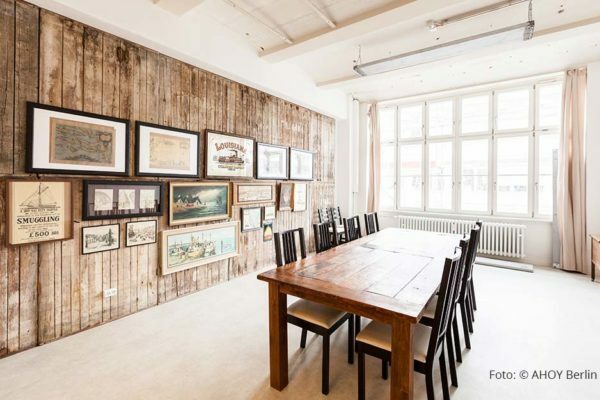 Furthermore, this property is centrally located, and the en vogue Mitte district is nearby. 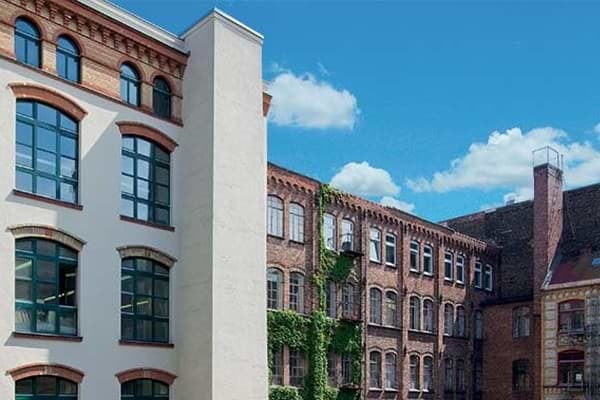 Lively and popular – this best describes the area around the Oranienstraße in Berlin-Kreuzberg where the master carpenter Löbich built this factory building for letting in 1865 – this is, by the way, one of the most beautiful and oldest industrial complexes in Kreuzberg. Today, the listed and attractive GSG-HOF, which was reconstructed in 1997, is located here. There is a good reason why mainly creative companies have set up business here – visual artists, a Kung-Fu school, a management agency and a photo studio. 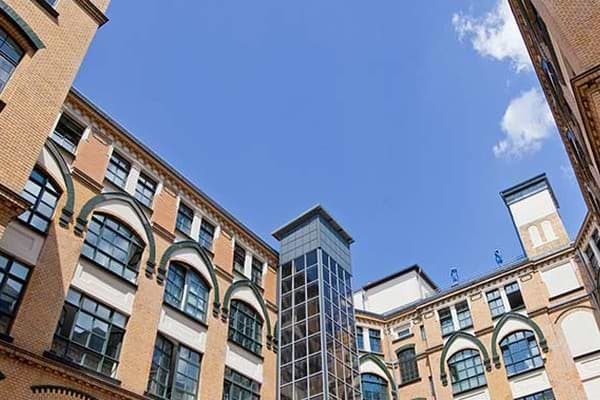 The two three-storied buildings with attic stories have 17 rental units with commercial units between 50 and 360sqm that are valued as offices, production facilities or commercial facilities. A colourful neighbourhood awaits the artists, traders and producers of this industrial complex. After all, the Oranienstraße with its many shopping facilities, cafés, snack stands and restaurants is within walking distance. The altered former Luisenstädtische Canal, the so called „Engelbecken“(„Angel Basin“) on the other hand invites for lingering or walking. 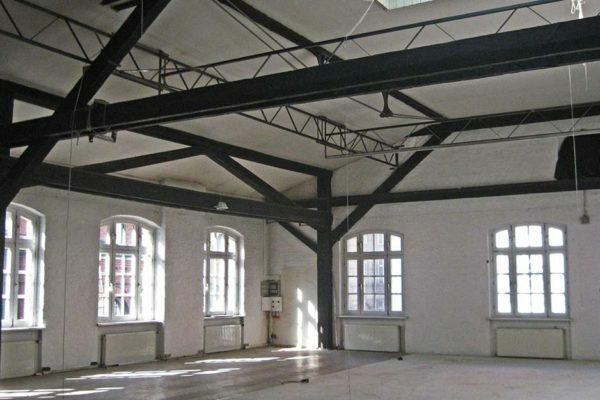 Sometimes, successful business ideas blossom in seclusion: The best example is this industrial complex from 1875 that counts among the most beautiful and oldest industrial complexes in Berlin-Kreuzberg. 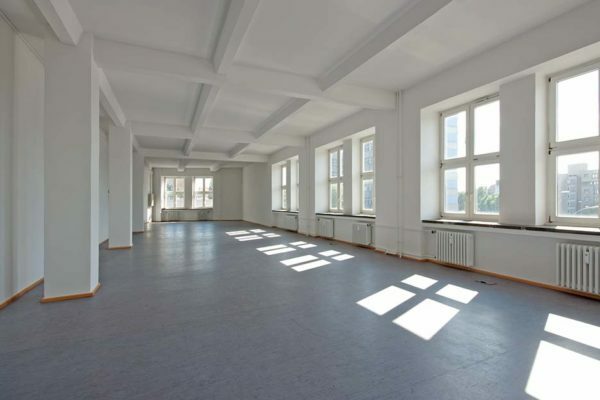 Centrally located but quiet – near Oranianstraße, Schlesisches Tor and the Mitte district. 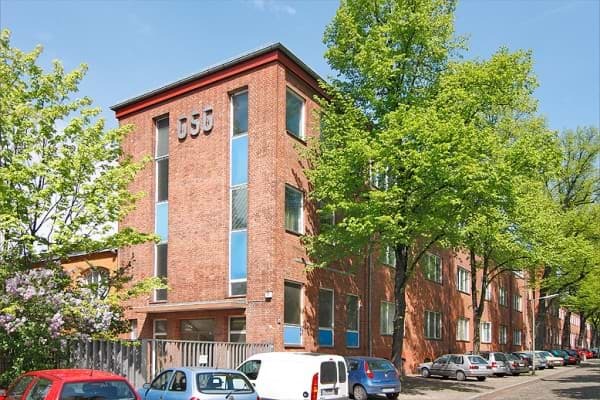 This asset is typical for Berlin’s industrial complexes and shapes the neighbourhood in which the listed GSG-HOF is located. Built in 1875, this complex of buildings with its striking clinker facade is one of the most beautiful and oldest in Berlin-Kreuzberg. 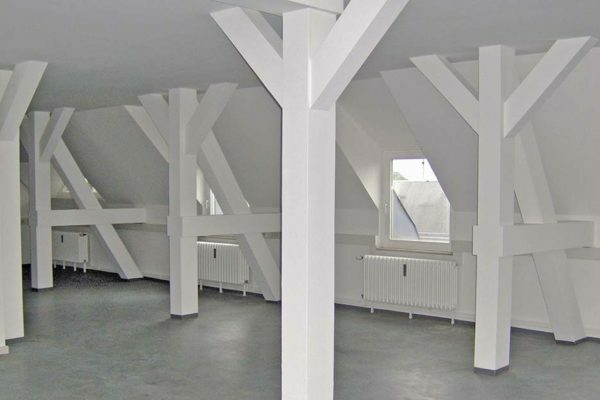 The property was renovated in 1997 and is connected to the neighbouring industrial complex Waldermarstraße 37A. The 17 rental units are extremely variable and can be used individually. This is especially appreciated by the creative clientele that has set-up business in the 150 to 430sqm sized industrial facilities – art printers, architects, audio drama producers and event manager, but also engineers and exhibition stand construction companies. 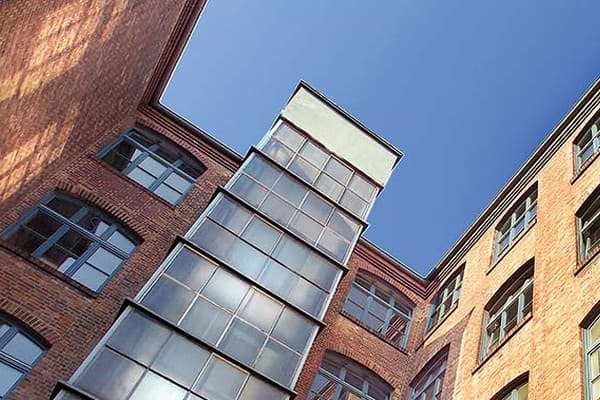 The neighbourhood of this industrial complex has a lot to offer: the Oranienstraße is lined with high-quality retail stores, cafés and restaurants and, not to forget, the legendary club “SO36”. The former Luisensträdtische Canal, the so-called “Engelbecken” (“Angel Basin”), which leads to the Landwehrkanal, is a place to walk and one for rest and recreation. 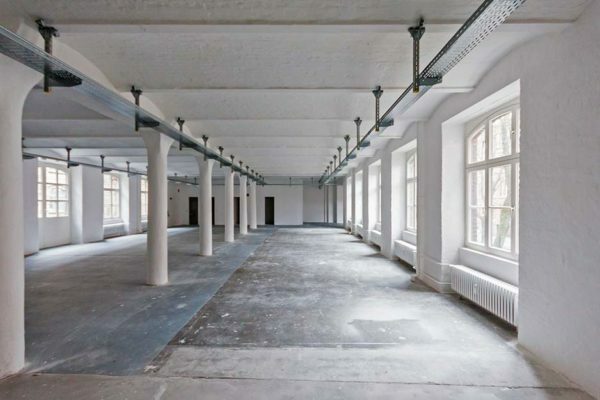 In the place where the traditional Berlin printing crafts once had their home, the printing business – among others – is being revived again in its entire variety in this GSG-HOF. 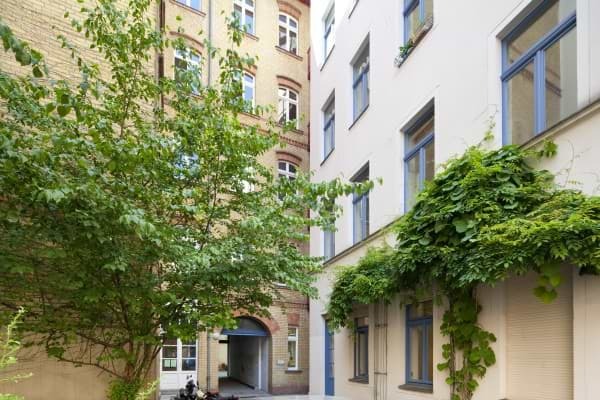 The five-storied property with its three yards offers a excellent and central location: in Kreuzberg, bordering Neukölln, between Kottbusser Damm and the Hasenheide Park. The popular Graefe quarter is not far from here. The Hermannplatz (Square), a vibrant area with a weekly market, Karstadt department store, shops and cafes is just a few meters walk away. Here you also find the subway station “Hermannplatz” with the lines U8 (Hermannstraße – Wittenau) and U7 (Rathaus Spandau – Rudow) and the bus stop 129 (Hermann Square – Roseneck). 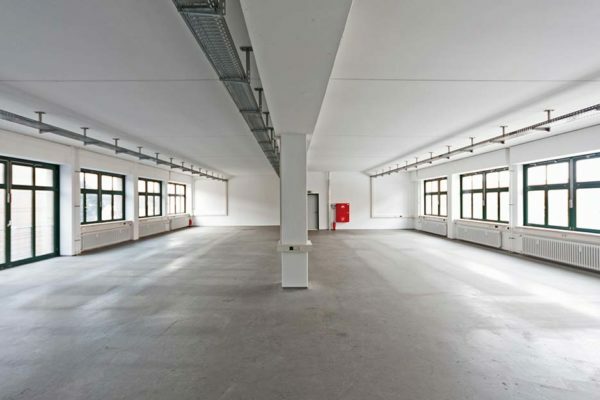 Right in the vibrant district of Berlin Kreuzberg, in the direct vicinity of the former newspaper district, you will find this GSG industrial complex. In 1910, the bright clinker building with the green ornaments was constructed by the builder Helmut Piefke. The building survived the Second World War unscathed, so the on-site printing plant was able to produce the daily newspaper “Tägliche Rundschau” as early as May 1945. Even today, the 14 rental units of the property mainly host large book printing plants. In the front building, there is a copy shop. Moreover, architects and firms from the sphere of dance have set themselves up in business here. 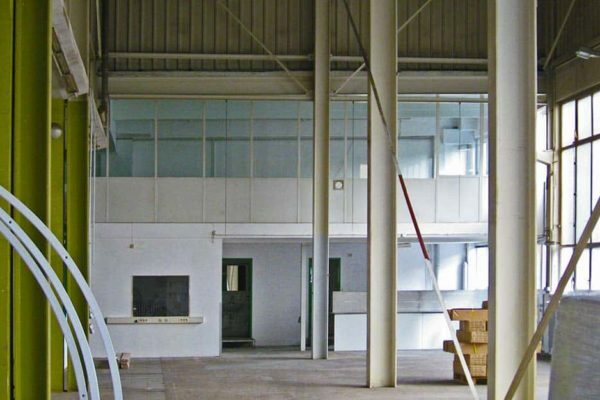 The commercial areas, ranging from 80 to 520sqm, are suitable as offices and commercial spaces and the accessible ground levels as production areas and workshops. 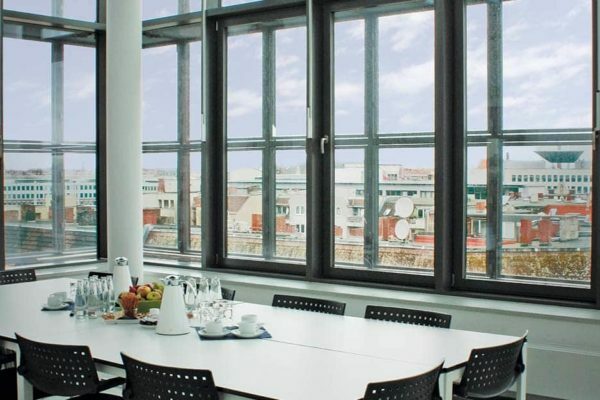 The lively Hermannplatz is very close to this industrial complex, a vibrant area with many shopping facilities: a weekly market, a well-assorted shopping mall, various retail shops, cafes, snack bars and restaurants, fitness studios and a DIY store. Those who do not find everything here can visit the Karl-Marx-Straße shopping mile. 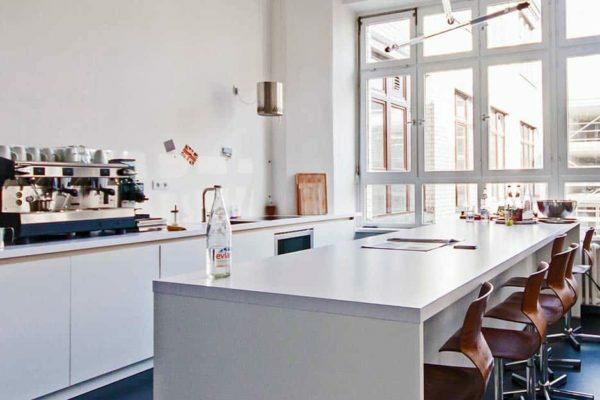 Smack in the middle of the trendy quarter but with a quiet backyard flair at the same time: this GSG-HOF in Berlin-Kreuzberg offers an inspiring environment with best infrastructure. Furthermore, the Schlesische Straße, another creative “hot spot” of the German Capital is located nearby. 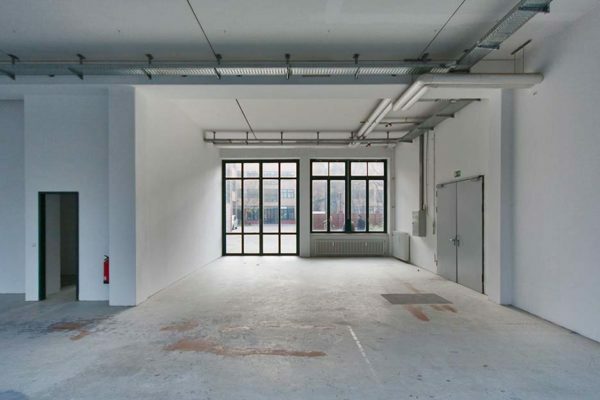 Small but nice: this GSG industrial complex is located in the middle of the lively Berlin-Kreuzberg district, almost directly at the underground station Görlitzer Straße. It was build as a typical factory building by Principal Johannes Kleer in 1908. Today, this cream-colored clinker building consists of eight commercial units with sizes ranging from 60 to 140 square meters. 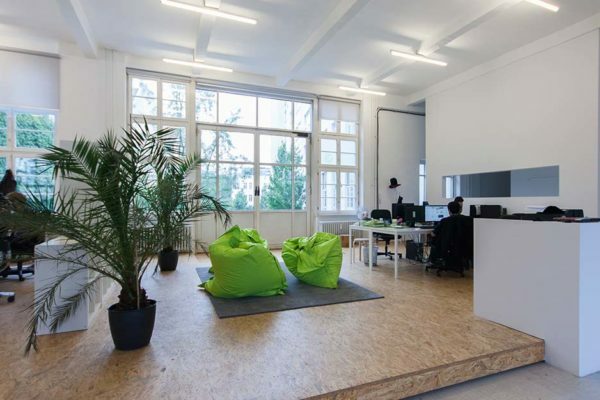 Creative people in the fields of art, dance and photography in particular have set up business in the office and commercial rooms mainly because the area around the popular Wiener Straße, Oranienstraße and Manteuffelstraße is nearby and offers a lively and inspiring environment. 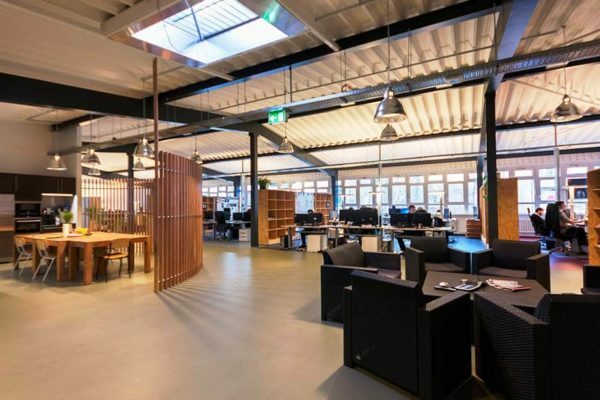 Living and working – this can be perfectly combined in this multicultural quarter – a circumstance the creative people who set up business in the offices and commercial rooms of this industrial complex value highly. The Görlitzer Park is right around the corner and in the Skalitzer Straße, cafés, restaurants and clubs can be found. The Oranienstraße with its lovingly managed retail stores and international gastronomy has been a “classic“for many years now. 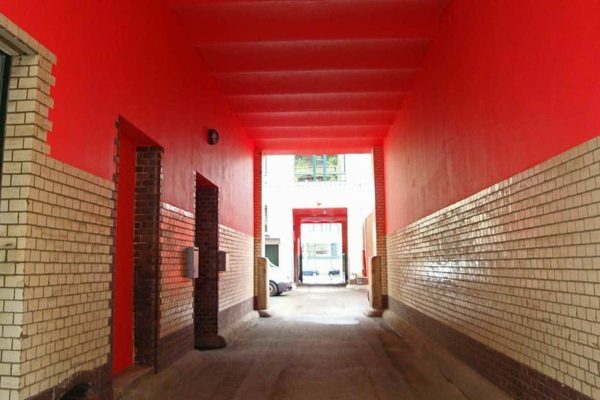 Directly on the west bank of the Spree and the Landwehr Canal, the GSG-Hof Schlesische Straße 26 is located between Oberbaumbrücke and Elsenbrücke in the district of Kreuzberg-Friedrichshain. The fashion center LABELS 1 and 2 as well as MTV and UNIVERSAL are located on the opposite bank of the Spree – in the Osthafen. Berlin’s center and Potsdamer Platz can be reached in 10 minutes by car. Just 1 km away is the B 96a, which provides quick connections to the Berlin motorway ring and Schönefeld Airport. 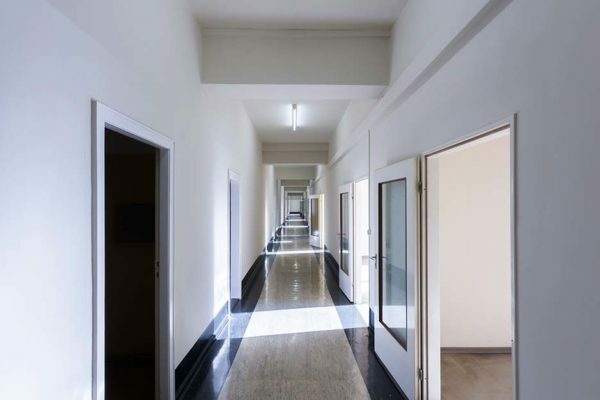 The building ensemble is based on the memory buildings of the 20th century and breathes Berlin’s big city charm. Visible from afar, the traditional clinker façade shapes the appearance and gives the object a special touch. According to the original definition, the levels are characterized by their spaciousness, which hardly limits the individual room design. Thus, the construction is particularly suitable for companies in the fashion, media and marketing industries, but also the craft will find ideal conditions to make visions come true with creativity. 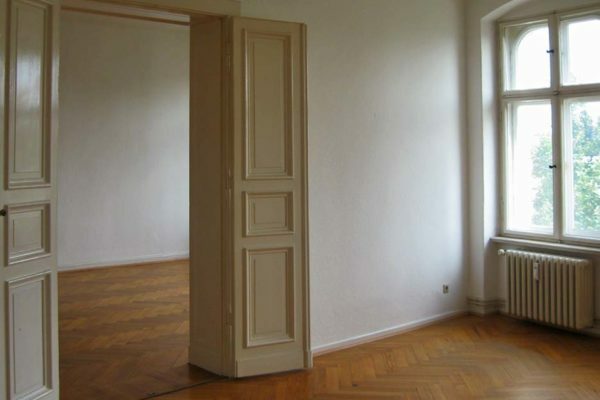 The central location as a location advantage in connection with the typical Berlin flair make the object unique. Note: This location is currently closed due to refurbishment and modernization. 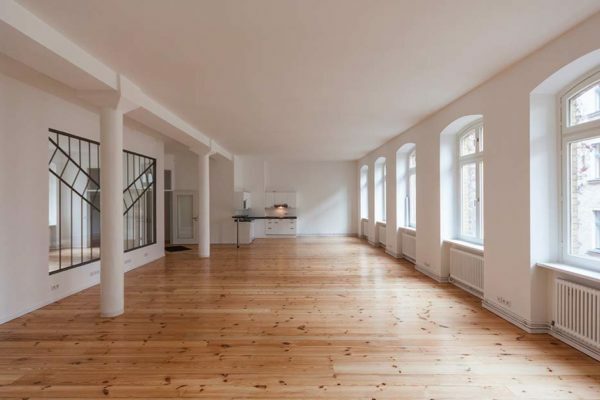 This property is located directly in the entertainment district Oranienstraße in Berlin Kreuzberg. Quiet but central – this is characteristic for the site of this five- respectively six-storied industrial complex at the Moritzplatz. 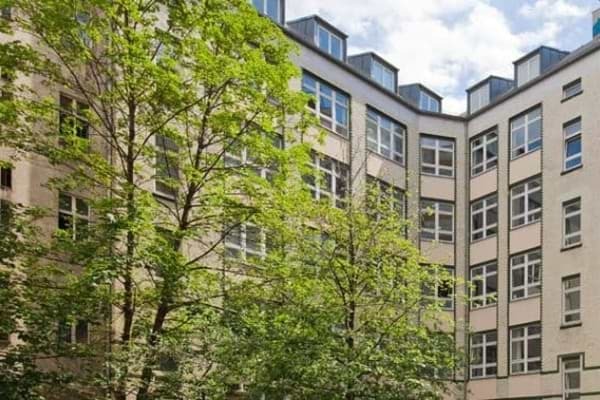 The Prinzessinnenstraße GSG-HOF is situated in an excellent, perfectly central and quiet location at Moritzplatz, in the Kreuzberg area of Berlin, on the border of the city centre. The east of the city can be reached in roughly 10 minutes by car. The Moritzplatz ( U8 line) and Prinzenstraße underground stations are within walking distance. Shopping facilities are in the near vicinity. The area around Kreuzberg’s Oranienstraße is in walking distance with restaurants, bars and classy retail stores. Today, both parts are connected. 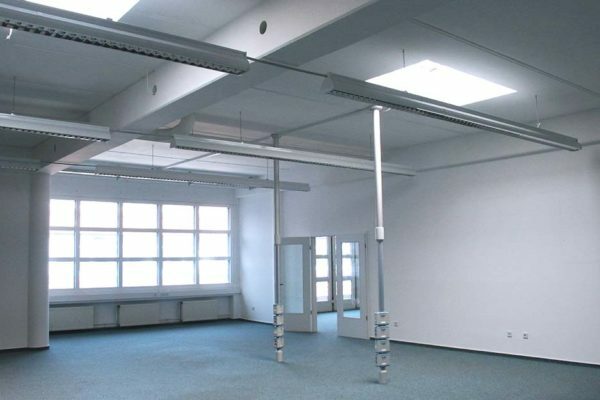 By now, the property, close to Moritzplatz and Oranienstraße, offers 31 commercial areas ranging from 57 to 500 sqm. 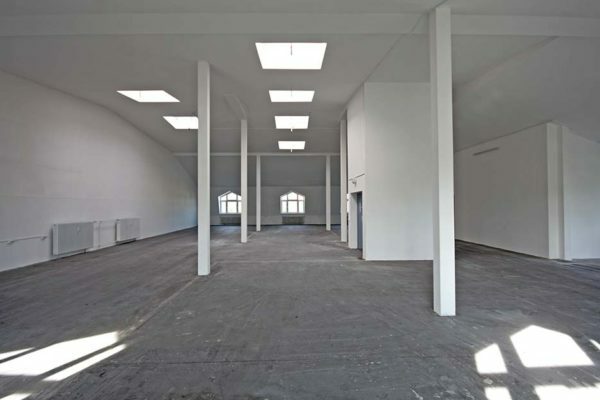 The former factory floor is used mainly by companies from the creative industry: online-agencies, the Jounalistenetage and coworking space and café-atmosphere in the Betahaus. Planet Modulor (hosts SME from trade, handcraft, art and culture), the Axel-Springer publishing house, the federal printing plant as well as a quantity of smaller commercial enterprises, amongst others printing plants, car dealers and car repair shops, are found in the direct vicinity. 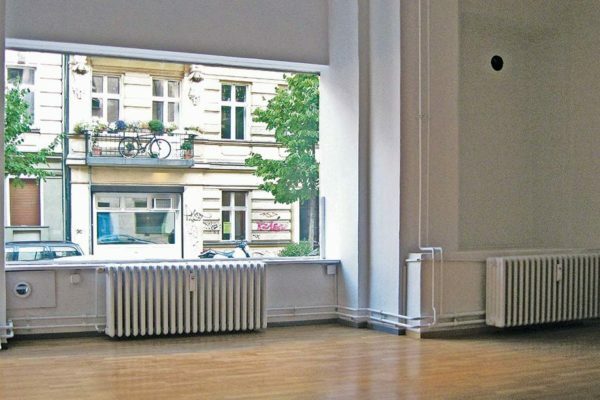 Many creative people have settled down in the nearby Oranienstraße. 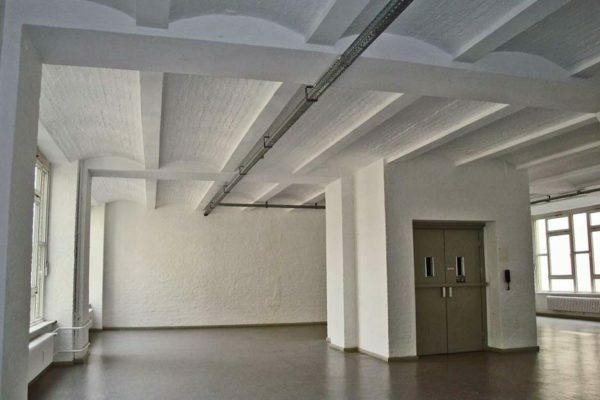 You will find this light-industrial complex in one of the best Kreuzberg micro-locations near Paul-Lincke-Ufer, one of the most admired locations. It is surrounded by Wiener Straße, Ohlauer Straße and Reichenberger Straße. The east of the city with Alexanderplatz can be reached in roughly 7 minutes by car. The motorway A100 can be reached within 15 (Oberlandstraße). There are several buslines, the metro station Görlitzer Bahnhof is in walking distance. The trendy area around Oranienstraße is in walking distance with restaurants, bars and classy retail stores. piano forte Hof: a throwback to the past. 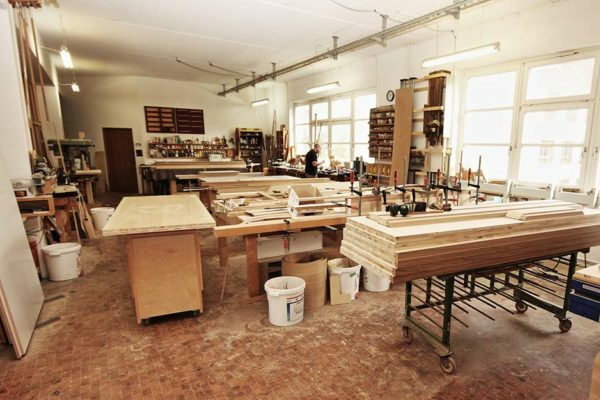 Once, the world famous company Bechstein used to build their pianos in the same place where you find booming businesses today. 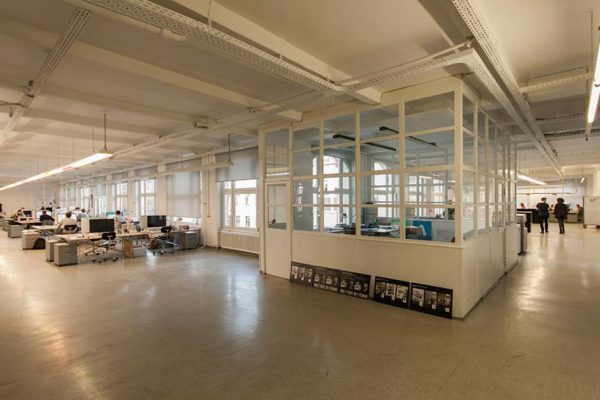 Communication technologies and TV productions are just two exemplary fields in this GSG-Hof in Berlin-Kreuzberg. 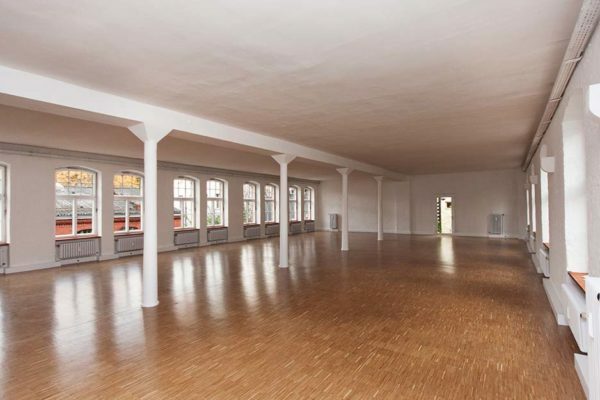 Between 1886 and 1907, this ample building complex was established for the piano manufacturer. Instruments were produced here until 1988. In memoriam, the traditional company’s cipher can still be seen on the prominent five-storied main building. The metal covered chimney of the former heating house is also still visible – and set in scene artistically in the shape of an elf-stone. 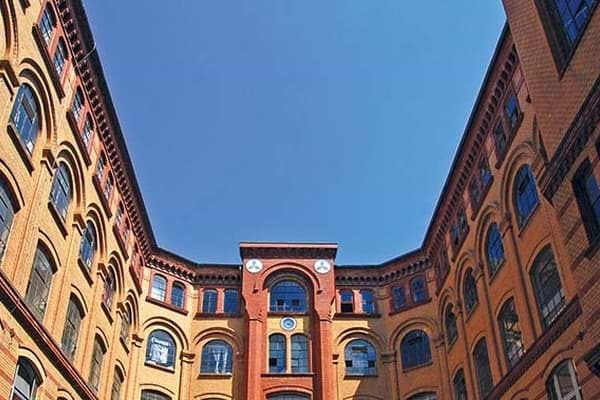 Today, plant construction firms, architects, film producers, software designers, radiotelephony technologists and a diving equipment supplier appreciate the winsome brick building with its unique segmental arch windows and numerous ornamental elements like wrought-iron tie rods. 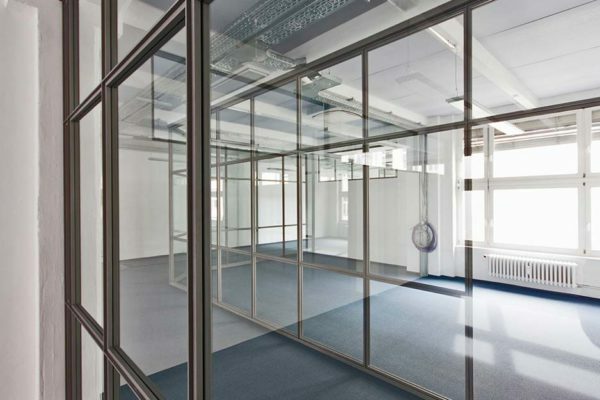 Whether as office, production or commercial space – areas range from 100 to 900sqm. This industrial complex lies right in the vibrant centre of Kreuzberg. A mixture of life and work marks this characteristic Gründerzeit – the period of the industrial revolution in Germany – environment. Very attractive cafes, restaurants and bars have settled down at the idyllic Landwehr canal – next to media firms, creative economy, as well as technical companies. Moreover, Oranienstraße, Wiener Straße, Hermannplatz and Karl-Marx-Straße with their various shopping facilities are not far away. 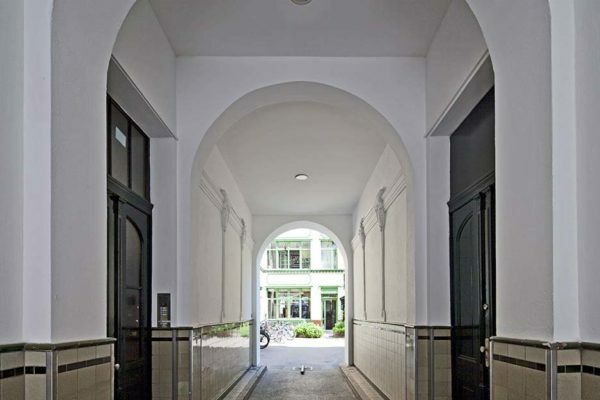 Right in the centre and still in a quiet, relaxed working atmosphere: This GSG-HOF in Berlin Kreuzberg, very close to the Heinrichplatz, is splendidly located: At the gates, tenants will find the colourful, creative multicultural atmosphere of the district. Those who look for recreation can use the internal roof garden. Underground station Kottbuser Tor is in walking distance. Potsdamer Platz within 5 min. by car and about 8 min. to the city motorway via Tempelhofer Damm. 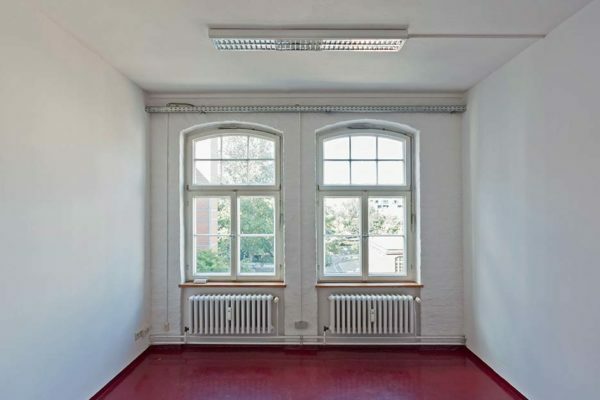 It is a bright clinker building at the back of the site, right in the centre of the lively Berlin Kreuzberg district– within a stone’s throw of the Heinrichplatz. 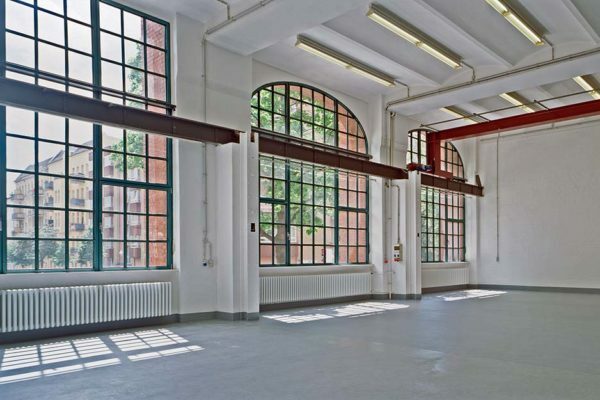 In this renovated industrial complex of the GSG, you have an ideal site if you like working undisturbed within the city centre. The building was constructed in 1890. The property is now part of a listed building complex. 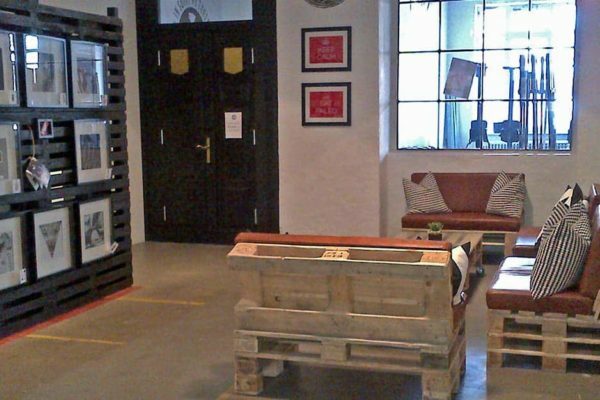 Very different businesses have established themselves in the eleven commercial spaces, ranging between 38 and 220sqm, individually usable as office, production or business spaces or as workshops – for example a gallery, a shop for musical instruments, a speech therapist, a sports school, as well as an artist. 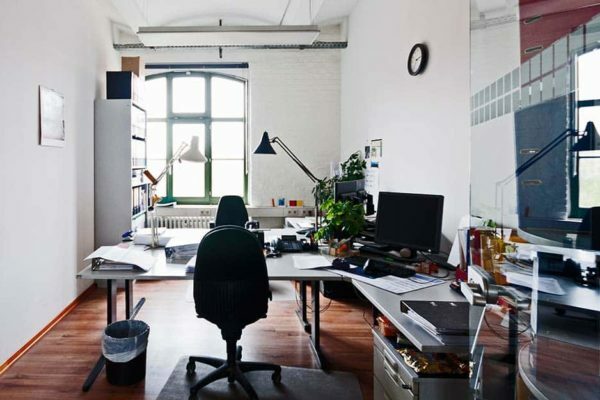 This environment is especially attractive for creative people. 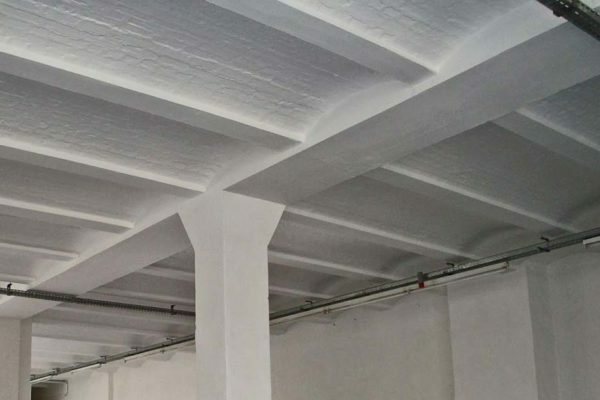 It is for this reason that well-known publicity agencies, artists, musicians, designers and service providers have established their businesses here, in the commercial areas, offices, workshops and studios on offer. In addition to the various shopping facilities in the Oranienstraße, several hotels, international cafes, snack bars and restaurants, as well as bars, offering relaxation after work, there are many recreational facilities on offer, for example in the Görlitzer Park – of course, everything within walking distance. 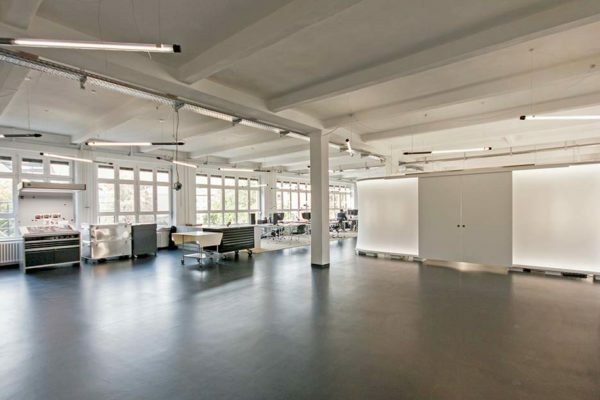 Right in the city centre, in the middle of a vibrant entertainment district, still providing space that allows comfortable and concentrated work. Metro stations Kottbusser Tor and Görlitzer Bahnhof are in walking distance. Potsdamer Platz within 5 min. by car and about 8 min. to the city motorway via Tempelhofer Damm. 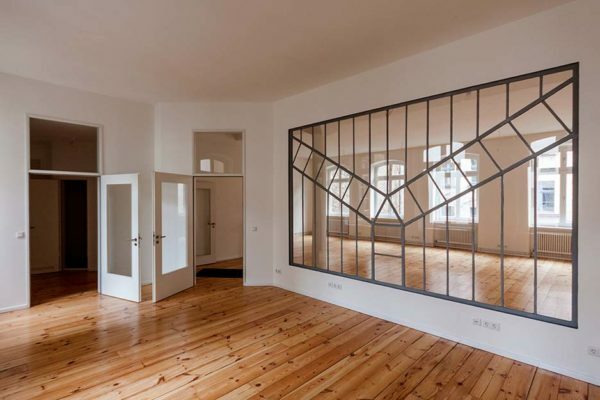 Being surrounded by city life and still being able to work undisturbed – this possibility exists in this GSG-HOF in Kreuzberg, part of a listed building complex. The five-storied bright brick property with the green ornaments was constructed in 1905 – it is a typical industrial complex in Berlin. 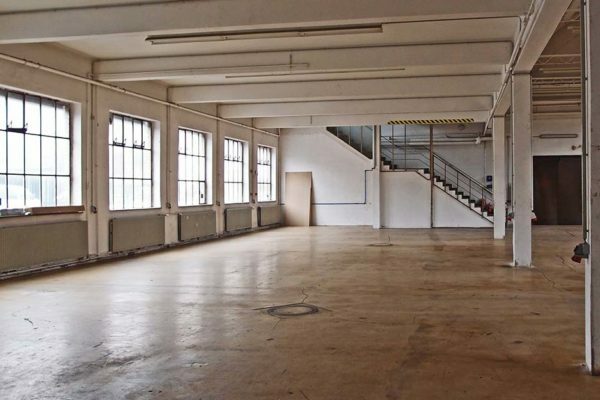 In the front, there are business areas and flats, in the back, there are offices, commercial and production areas. 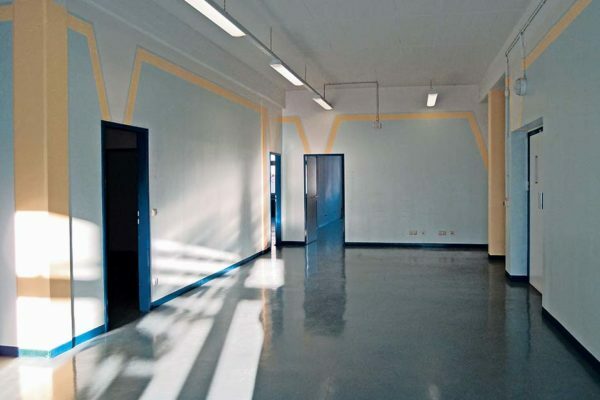 More than 14 commercial units, with individually usable rentable areas between 30 and 350sqm, are located here. Among the tenants, there is a betting shop, a hairdresser, as well as a locksmith and a manufacturer of medical equipment. Moreover, a lawyer’s office, a publicity and design agency, a publishing house, an IT firm and a landscape gardening office are to be found on this property. A colourful mixture of very different businesses has located in the commercial spaces: trades people and enterprises from the fields of film and TV production, media, IT, commerce and gastronomy form an inspiring togetherness. Around all this, you find the most colourful cultural life – with international cafes, bars and restaurants, clubs and retail shops, lovingly cared for. 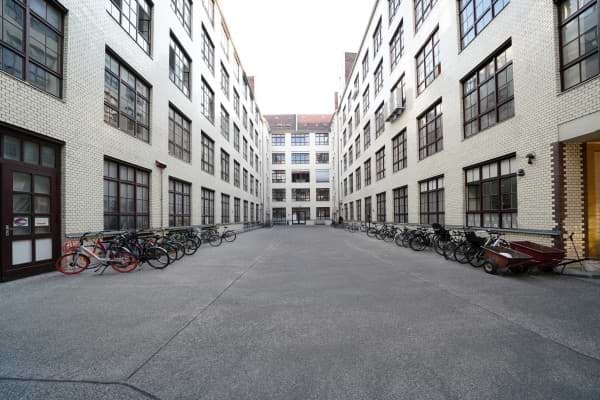 Berlin-Kreuzberg presents itself as a good address – and not only in the creative field with its agencies, studios and workshops. 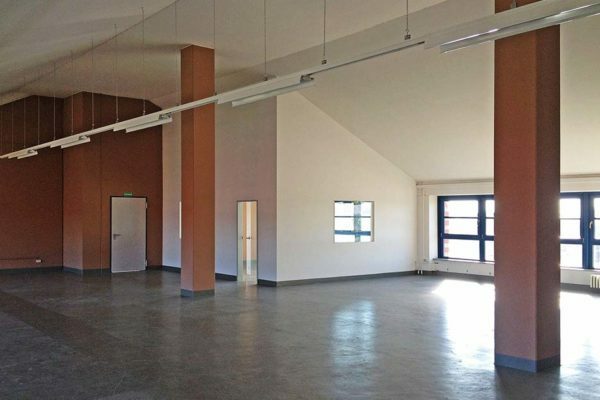 This commercial complex of GSG with its four buildings and two yards is located in the popular Oranienstraße – and therefore right in the city centre. Metro station Kottbusser Tor is in walking distance. Potsdamer Platz within 5 min. by car and about 8 min. to the city motorway via Tempelhofer Damm. 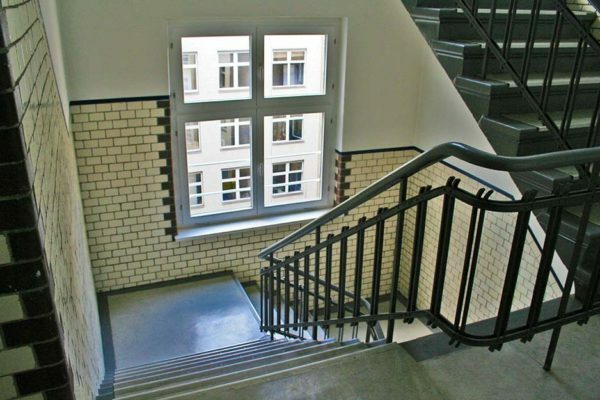 The characteristic Kreuzberg mixture of living and working is in demand again – just like the white clinker GSG-Hof in the Oranienstraße 10-11. Constructed in Berlin Kreuzberg between 1863 and 1907, today it is part of a listed building complex. 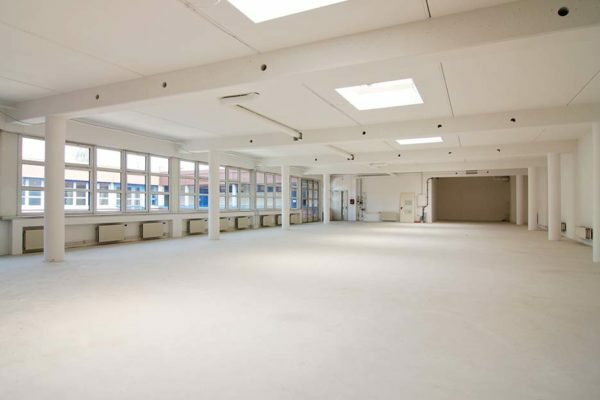 The ten rental units can be used as office, commercial space, workshop or production space, and they are distributed over four buildings – with areas ranging between 25 and 250sqm. 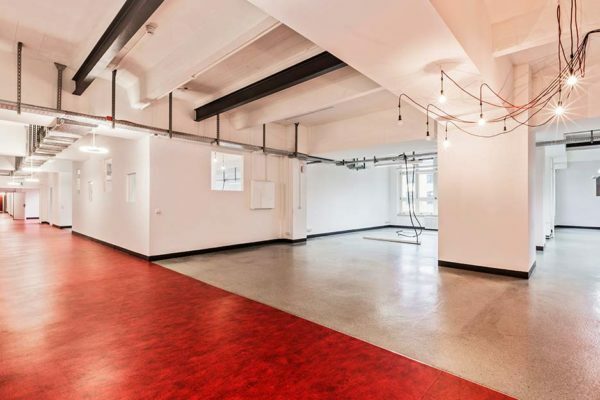 Tenants will find a colourful business mix of printing plants and a leather manufacturer, a pizza parlour, an Asian restaurant, information technology and photographers. Tenants will find a developed infrastructure: The nearby market hall in the Eisenbahnstraße and upmarket retail stores in the Oranienstraße offer excellent shopping facilities. 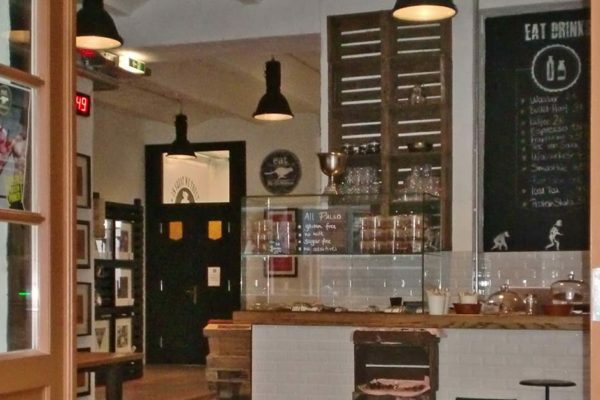 For lunch or business meetings, you will find international cafes, restaurants and bars in this well-known town quarter. Public parks and a swimming pool in the direct vicinity are another attraction. And the district, economy and tax authorities are not far away either. Centrally located, between Heinrichplatz and Manteuffelstraße. Metro stations Kottbusser Tor and Görlitzer Bahnhof are in walking distance. Potsdamer Platz within 5 min. by car and about 8 min. to the city motorway via Tempelhofer Damm. 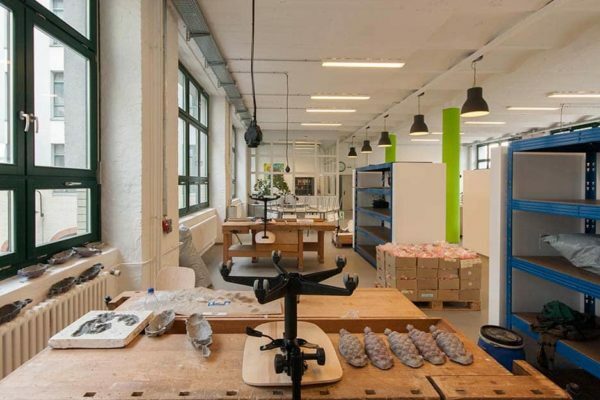 Berlin-Kreuzberg – that’s not merely bars, arts and charm, but rather a place of groundbreaking technical innovation. A good example of this is the GSG-Hof, Oranienstraße 6. It was here that Konrad Zuse, the inventor of the computer, completed the first programme controlled, freely programmable data processor in 1941. 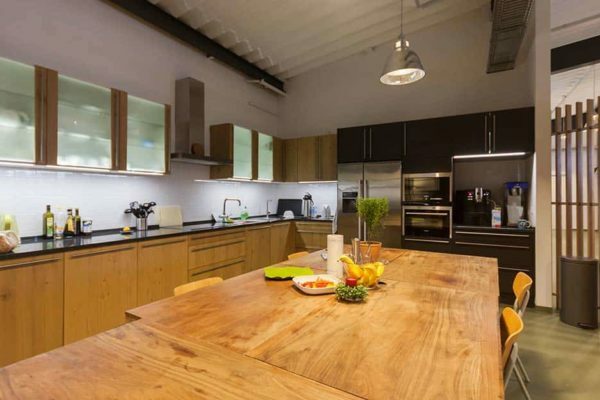 Even today, businesses from the IT sector work in this carefully renovated, listed property – next to enterprises from the fields of film and TV production, media, trade and gastronomy. In 1875, the master carpenter Robert Otto constructed a residential house on to the street. In 1897, the government architect Georg Lewy built the five-storied commercial building at the back. In 1929, the original stucco front was replaced by a New Objectivity front. The vaulted ceilings however, distinctive of the architecture of the turn of the century, have survived. 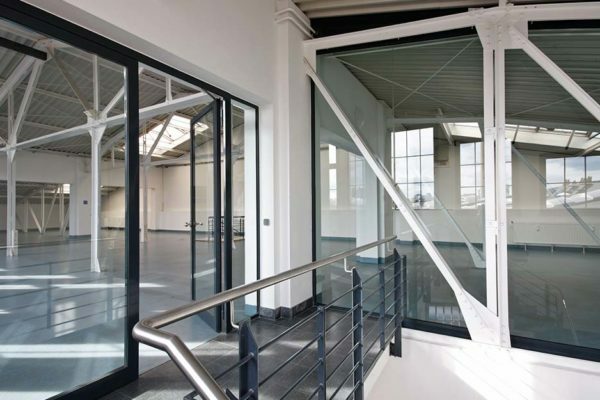 The building comprises a total of 20 commercial units. 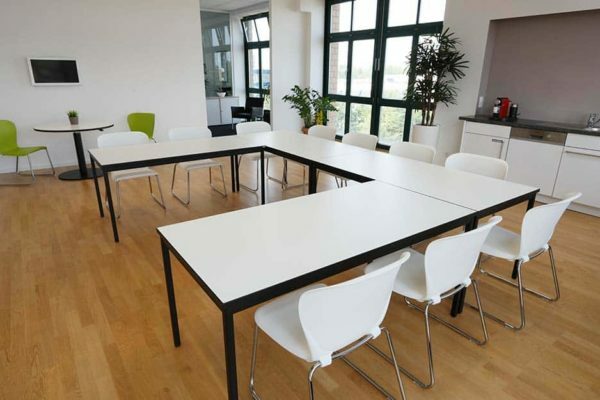 The rental areas range from 30 to 300sqm and are very adaptable: as business space, office, production or commercial areas. 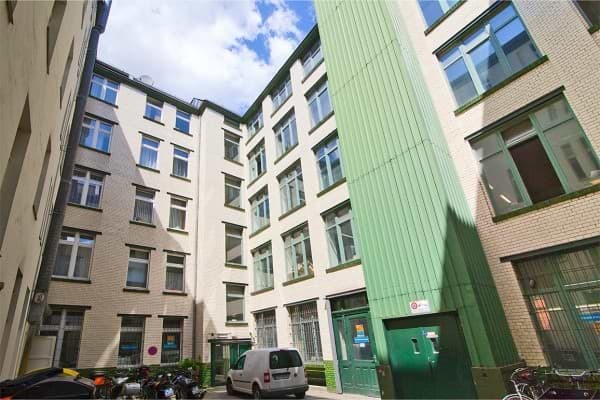 The Lobeckstraße GSG-Hof is situated in an excellent, central and perfectly quiet location at Moritzplatz, in the Kreuzberg area of Berlin, on the border of the city centre. The east of the city can be reached in roughly 10 minutes by car. The Moritzplatz (U8 line) and Prinzenstraße underground stations are within walking distance. 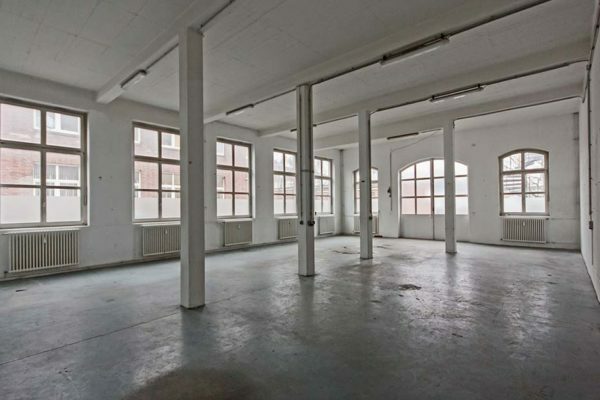 Once, the master typographer Otto Elsner had his factory building constructed here in Berlin-Kreuzberg between 1912 and 1914. 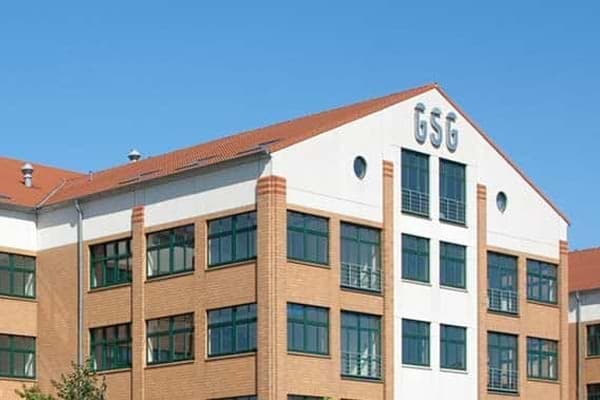 Today, the traditional old building is listed and owned by GSG. The whole complex was renovated in 1989 and expanded by a three-storied new building. 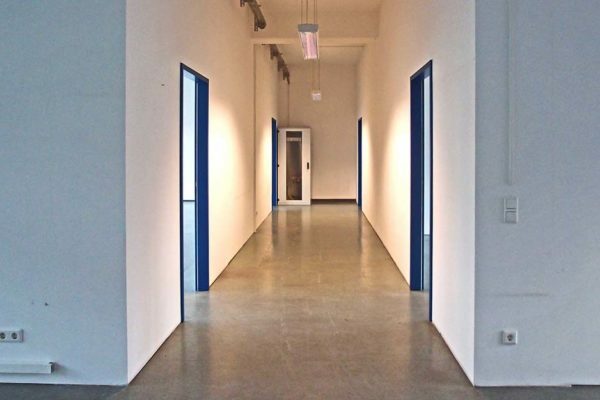 This industrial park has a number of industrial units ranging from 300 to 700sqm in size that can be used as offices or for production purposes and smaller commercial units from 20sqm as studios. A number of creative and trades people and various other companies have set up business here: e.g. creative industries, printer, graphic artists and engravers, medical engineers, architects, engineers. 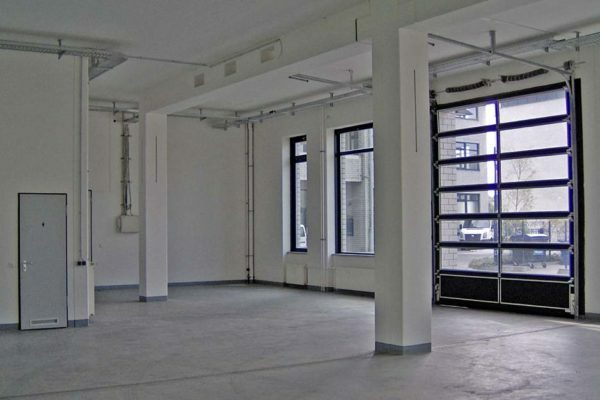 The commercial complex is located behind the main new creative hotspot at Moritzplatz/Prinzenstraße with Modular Planet and the Aufbau Verlag. The lively and unique neighbourhood of the Oranienstraße is only a few minutes walk away – with its restaurants, cafés, bars and classy retail stores. A circumstance also valued by the tenants of the complex: The closeness to the former “Checkpoint Charlie“and the new galleries add new appeal to this yard. If you want to catch your breath from the fast paced city life, the bank of the nearby Luisenstädtischer Canal, also known to Kreuzberg citizens as the “Engelbecken” (“Angel Basin”), in the direction of the Landwehrkanal invites for relaxed walks. Alexanderplatz, Hackesche Höfe, Unter den Linden, Friedrichstrasse and Potsdamer Platz with their museums, restaurants, opera houses, cinemas and shops are only a maximum of two kilometres as the crow flies from the historical Luisenstadt, in the western part of which are situated the AQUA-Höfe. 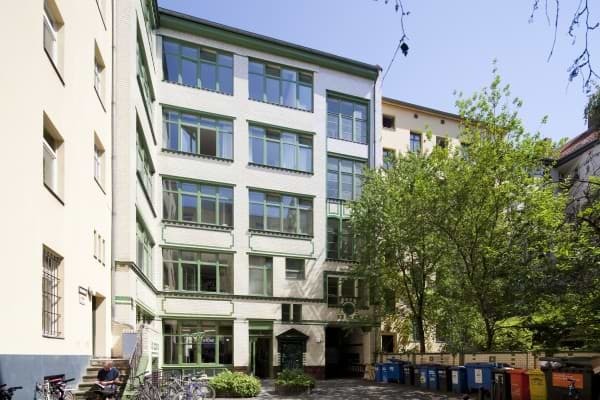 The AQUA-Höfe in the Lobeckstraße are situated in a superb central and very quiet location at Moritzplatz in the Kreuzberg district, bordering the Mitte district. The City-Ost, the eastern part of the city, can be reached in about ten minutes. The underground stations Moritzplatz (underground line U8) and Prinzenstraße are both within walking distance. 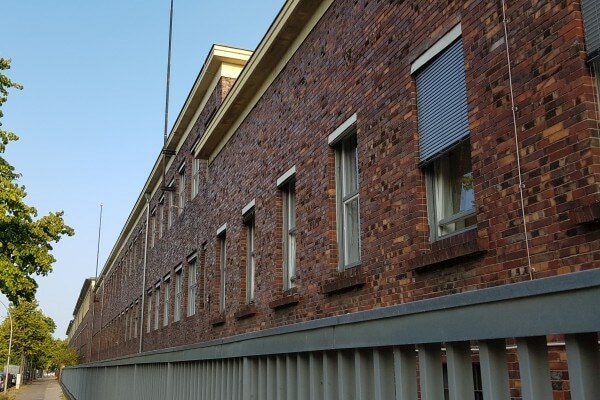 Originally built as an armature and metal goods factory at the end of the 19th century, the Aqua Butzke-Werke AG (production of sanitary fittings), as it was known since the mid-1970s, has lent its name to the location as we know it today. The architect and government architect Georg Lewy fitted the facades out with multicolored bricks, pillars and round arches and decorated it lavishly with Art Nouveau elements. The construction year of the listed building was 1898 (year of completion); the new building with components I and II followed in the 1960s. The entire building has five upper floors in the old building, two upper floors in the new building and a common basement (cellar). 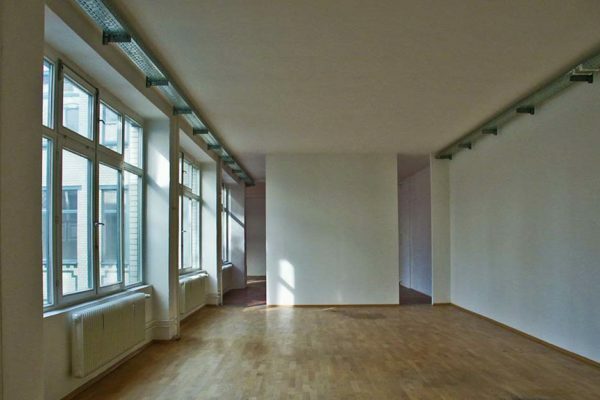 From 2011 – 2012, the extension in the Lobeckstraße, originating from 1960s, was renovated, insulated and energy-optimized. 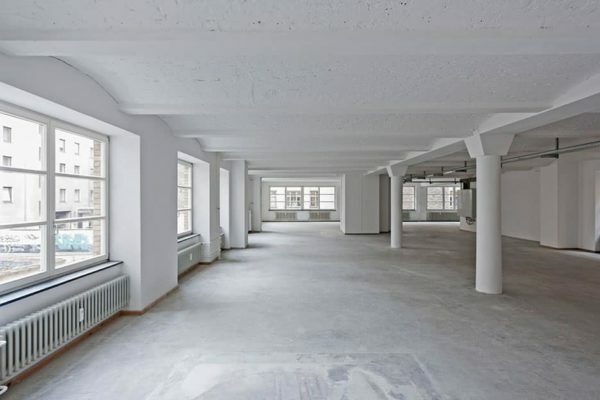 Several hundred square meters of new office space have been created. 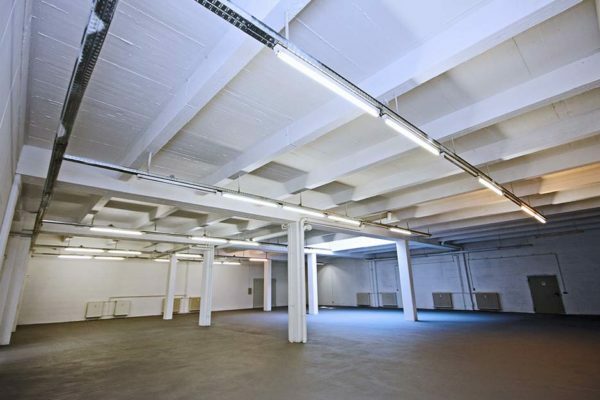 The commercial units, divided into small sections, are currently rented to different users in the creative industries. In the immediate vicinity of the AQUA-Höfe numerous projects and initiatives, closely related to the philosophy of the AQUA-Höfe and which have been partly inspired by it, have been established here in recent years. They are making the area around the nearby Moritzplatz more and more into a centre for creative people. 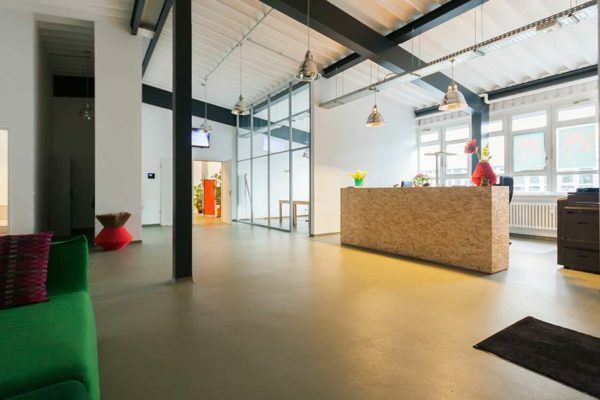 For tenants of the AQUA-Höfe, this creates valuable synergies and opportunities for networking: Modulor Planet, Aufbauverlag, Prinzessinnengärten, Betahaus. Only a few minutes’ walk from the industrial complex are the distinctive, vibrant neighbourhood streets around the Oranienstraße – with its restaurants, cafes, bars and sophisticated retail stores. 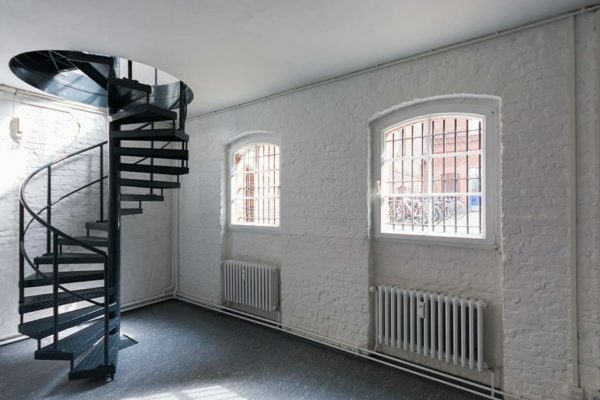 Additionally, the proximity to the former “Checkpoint Charlie” and to galleries that have been newly established here has lent the building complex new charm. For a break from city life, the banks of the nearby Luisenstädtischer canal, also known by the Kreuzbergers as the “Engelbecken” or “Angel’s Basin”, offer an invitation to take a relaxing stroll in the direction of the Landwehr canal. At the Köpenicker Straße, there are several commercial complexes as well as e German Center for Architecture DAZ. Nearby there is an area Mediaspree with the major music labels such as Universal Music and MTV. In just 5 minutes you can reach the Alexanderplatz in Berlin-Mitte. The metro stations Görlitzer Bahnhof and Schlesische Straße can be reached in 5 minutes walk. A market hall with its many shops located in the Eisenbahnstraße. Further shopping facilities, restaurants and a multiplex cinema are located at the Park Center at Treptower Park, about a 3 minutes bus ride away from the industrial complex. 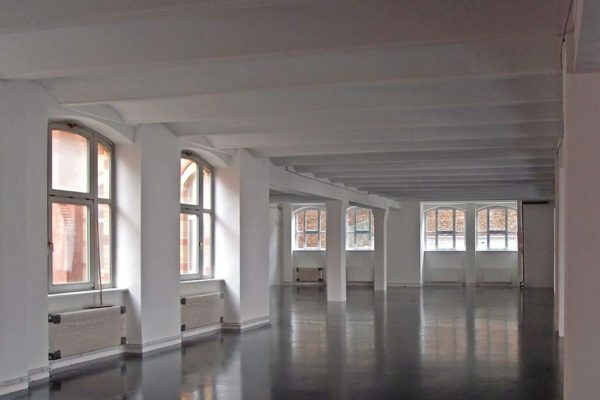 Coming from Ostbahnhof railway station, the Mediaspree area cannot be missed: on both sides of the river Spree, music labels Universal Music and MTV as well as popular clubs and restaurants can be found. The listed five-storied GSG-Hof, which was built in 1891/1923, is located nearby. Creative enterprises, service providers and trades people have set up business here. Branches range from the media and advertisement to photography, architecture, design and IT. 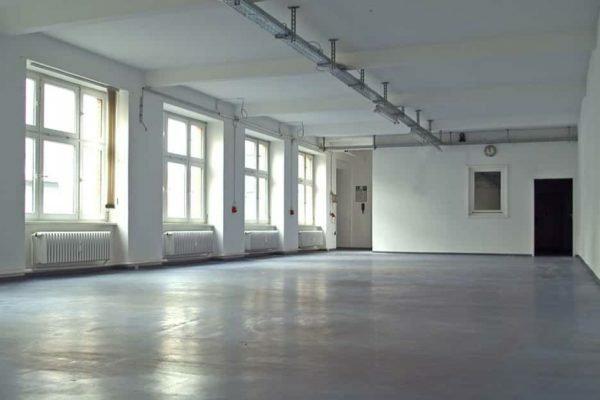 There is a similar wide variety of commercial units offered at this property in Berlin: offices, workshops, commercial and production facilities for rent are between 90 and 450square meters in size. History meets contemporary zeitgeist: today, the Wilhelminian style building which was constructed in 1891/1923 is home to media businesses, advertisement agencies, photographers, architects, designer and information technology engineers who do not only value the inspiration this quarter has to offer but also the short ways: the nearby market hall in Eisenbahnstraße has all necessary convenience goods for sale. The Alexanderplatz with its shopping facilities is only a five minute drive away, and the ParkCenter Treptow, seven minutes away by bus, has a shopping mall, restaurants, cafés, a multiplex cinema and a fitness center to offer. About 1 km west of this commercial complex the Heinrich-Heine-Straße underground station (line U8) can be reached. Several bus lines can be found in about 100m at Bethaniendamm. Heading east, around 1km awqy, there is the metro station Schlesisches Tor or Oberbaumbrücke. In just 5 minutes you can reach the Alexanderplatz in Berlin-Mitte. North of the River Spree you will reach the station Ostbahnhof in about 600 m.
Because of the factories, backyards, army institutions and villas with blooming gardens facing the Spree, life was already teeming in this district when the buildings of this GSG-industrial complex were constructed in 1888/1889. These days, this quarter in Berlin-Kreuzberg booms again thanks to the nearby Mediaspree area with big music labels like Universal Music and MTV, thus making this industrial park with its yellow clinker facades and vaulted ceilings typical for its date of origin, an interesting and attractive address for different kinds of industries. 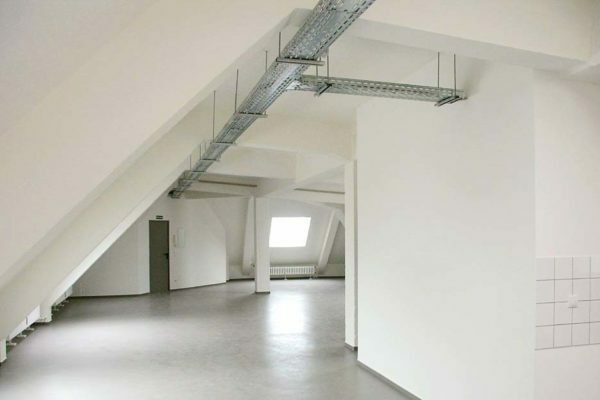 This commercial complex consists of three side buildings with basements (usable as storage), four upper floors and an attic floor. 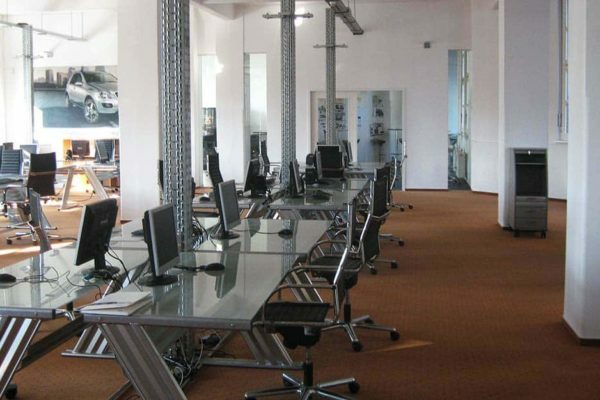 Media companies, designers, advertisement agencies, printing plants and carpenters who appreciate the property with rental spaces ranging from 60 to 270 square meters for offices, production or commercial facilities, have set up business in the 23 commercial units. 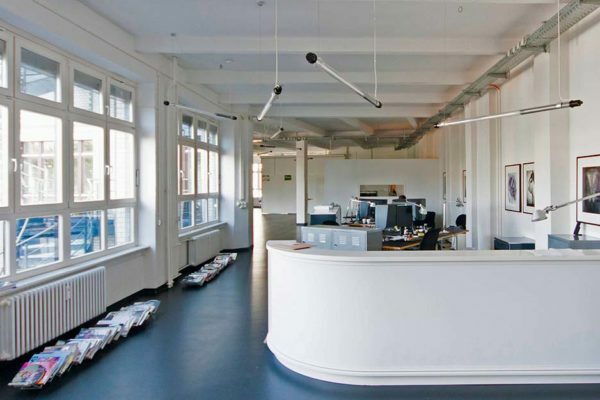 The immediate proximity to the large music labels Universal Music and MTV as well as the German Architecture Center (DAZ) make this location especially interesting for media companies. The market hall in Eisenbahnstraße just around the corner has everything to satisfy everyday needs. The Alexanderplatz with its attractive shopping facilities is only a few minutes away. Further shopping facilities, catering and even a multiplex cinema can be found in the ParkCenter at Treptower Park, which is only seven minutes away by bus. In the near vicinity: Engeldamm, Bethaniendamm, Spree, Oberbaumstraße, U-Bhf. Schlesisches Tor, U-Bhf. Heinrich-Heine-Str. Gneisenaustraße is situated very close to the popular Kreuzberg neighbourhood and is one of the most important east-west connections in the southern town centre. The lively multicultural Bergmannstraße district offers numerous cafés, restaurants, supermarkets and shops and is only a few minutes away from the GSG-Hof. Potsdamer Platz as well as central institutions of economy, politics and administration are just a few minutes away by car. The motorway A100 can be reached within 8 minutes via Tempelhofer Damm, underground stations Gneisenaustraße and Südstern by 5 minutes walk. Leisure and recreation facilities are nearby at the Hasenheide parks with its extensive gardens. The Gneisenaustraße in Berlin Kreuzberg was originally constructed as a luxury boulevard. Even today, this is can still be seen in the building of the former construction business Wilhelm Peters, designed as a residential house in 1908, with its impressive country style front. At the back of the plot, however, eight five-storey white clinker commercial buildings with three inner courtyards were constructed. Today, the GSG-HOF with its decorative front building has been restored elaborately. 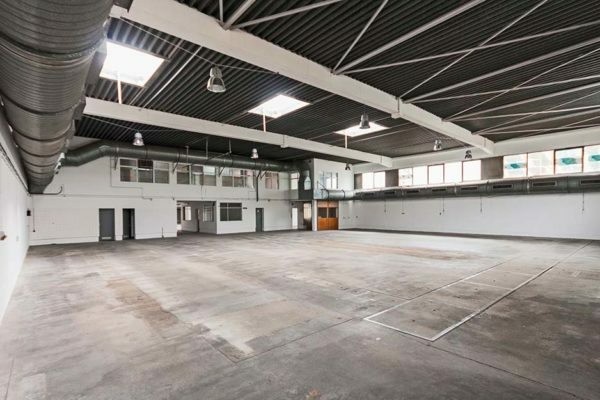 30 rental units, variably usable as office, commercial area, workshop or manufacturing facility, are distributed over three sections of the building – with areas between 70 and 900sqm. Various businesses are represented – from arts to media to service and crafts: A lawyer’s office, a visual artist and an event manager as well as a carpenter, a baby clothing firm and an electrical installation firm have established themselves in the rooms of this industrial complex. Tenants of this complex will find an innovative environment already on the site itself. The Bergmannstraße with its international cafes, restaurants and retail shops is even livelier and lies within walking distance from the industrial complex. Moreover, excellent shopping facilities can be found in the Marheineke Market Hall and in the supermarkets. The Hasenheide public park offers recreation in its ample green areas. Blücherstraße is located near the popular Bergmann neighbourhood with its multicultural Cafés and restaurants. You can reach Berlin’s city centre Mitte or Potsdamer Platz with a shopping mall, cinema and theatre, within short time by car or public transport. 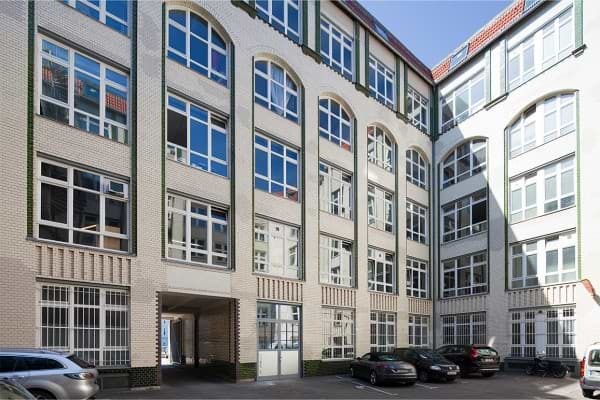 City-location in Berlin-Kreuzberg: Only 4 minutes via Mehringdamm and Stresemannstraße to Potsdamer Platz. Hallesches Tor (U1 Warschauer Straße – Uhlandstraße) and Gneisenaustraße (U7 Rudow – Rathaus Spandau) underground are within walking distance. Metro busline M41 (Sonnenallee/Baumschulenstraße – S + U Hauptbahnhof) is at Urbanstraße/Baerwaldstraße. Architect August Gietenbruch had a neat Art Nouveau design in mind for the five-storied complex which was built for the German Wholesale Cooperative of Self-employed Master Glaziers in Berlin-Kreuzberg in 1910 – a jewel with ample ornaments of sandstone, shimmering green tessellated bands and spacious windows in the first floor. The extremely decorative bay is adorned with putti, a shimmering green tessellate band which nicely contrasts to the beige-coloured sandstone of the Art Nouveau Facade. 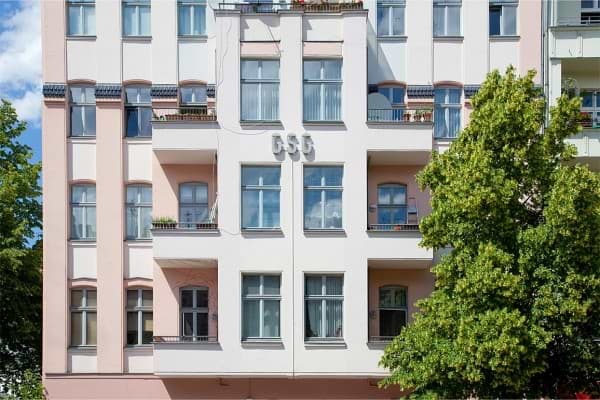 This renovated GSG-HOF Blücherstraße in Berlin-Kreuzberg doesn’t need to hide its interior either: five white clinkered backyards with their ample ornaments are an architectural special feature in and of themselves. 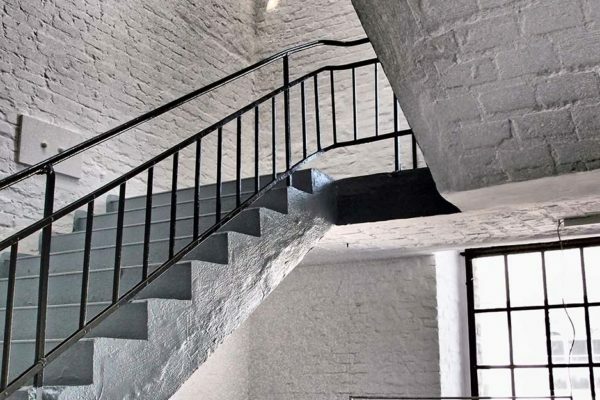 The attic stories of this reconstructed historical building have since been expanded. 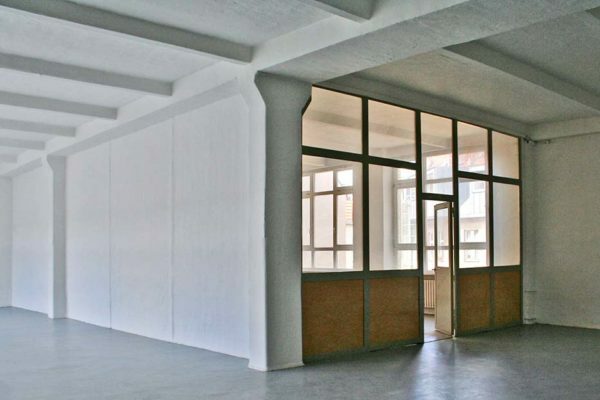 67 rental units offer commercial space between 72 and 650sqm that can be used as offices, businesses, workshop or production facilities – perfect for the printing shops, architects, the press and publishing, a trade fair stand construction company, a movie production company, an internet company as well as a software company. A wine merchant, a music label, a movie production company, but also computer companies have set up their businesses in the offices, business areas and production facilities. 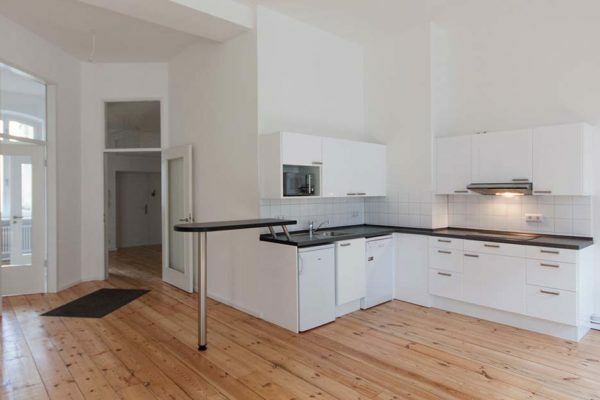 Near this charming property the popular Bergmann neighbourhood is to be found in close proximity to the “”Mount”” Kreuzberg, Mehringdamm and Marheinekeplatz, where the streets are lined with a wide range of cafés, restaurants, supermarkets and retail stores. 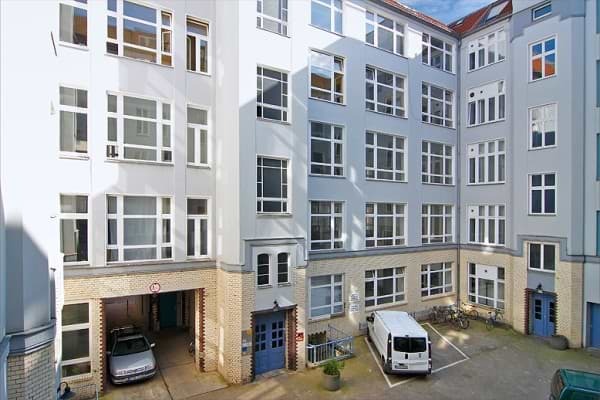 Kreuzberg, not far from the geographical center of Berlin, unique and authentic: this GSG-Hof is located directly opposite of the European Patent Office. Potsdamer Platz can be reached in about 5 minutes by car and the motorway via Tempelhofer Damm in about 8 minutes. The Prinzenstraße und Hallesches Tor underground stations are within 3 minutes walking distance. The love for detail that the famous architect duo Messel and Altgeld had is still visible today. This listed building complex made out of light brick, was built from 1895 to 1923 in the Neo Renaissance style. The door and window profiles of this yellow clinker building are decorated with intricately designed sheathings in Neo-Renaissance style. 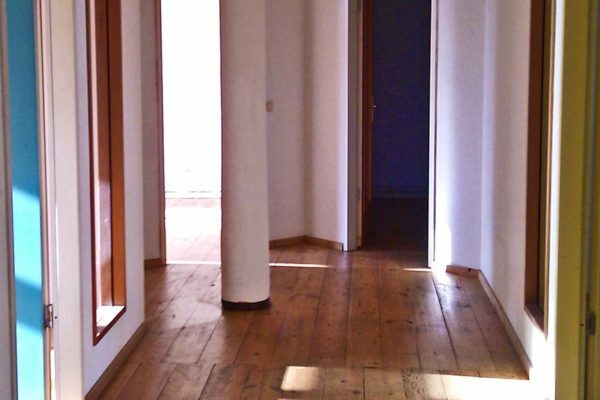 This property, which is nowadays used commercially, was renovated in 1987 and 2002 and is in very good condition. 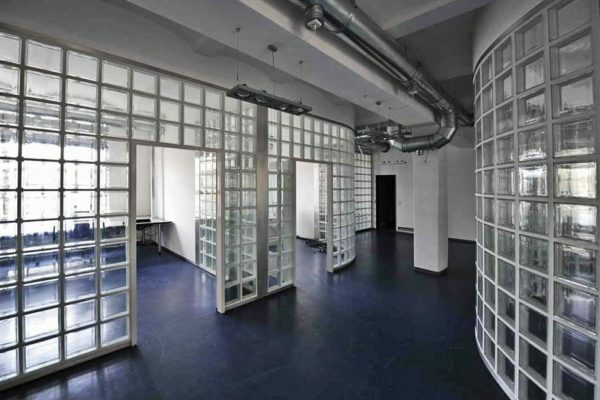 This property is amongst the most attractive innercity buildings of GSG Berlin. 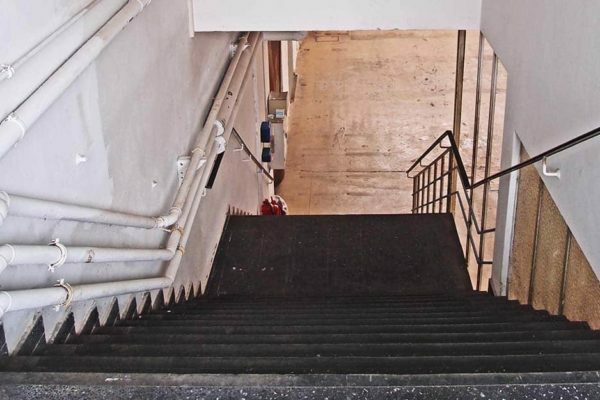 The building complex has a total of 30 commercial units with a total useable area of about 6,000 sqm.The size of the rental areas varies between 80 sqm and 280 sqm. 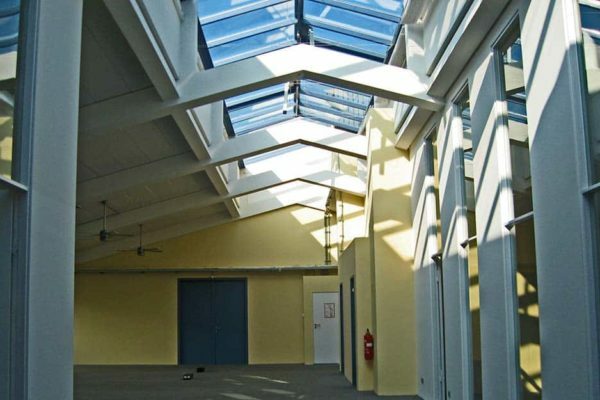 The commercial buildings can be put to various uses e.g. as office premises, business premises, manufacturing premises or workshops. From engineering offices and service providers to trades, various companies have found their home here. 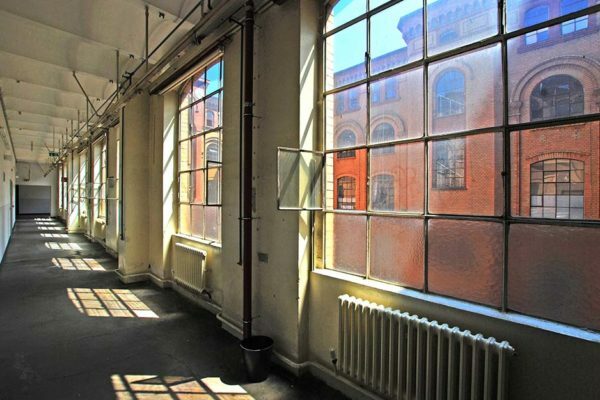 Carpenter, computer specialists and two visual artists – the range of tenants that have rented their offices, studios and factory lofts in this property is multifaceted. Nearby, the Axel Springer Publishing House and the arcade of the same name, as are a number of other businesses. Supermarkets are nearby (100m) in Gitschiner Straße and Ritterstraße. There is a wide range of diverse international gastronomy in the Oranienstraße. Adalbertstraße is centrally located in Berlin-Kreuzberg, where you find numerous shops and service providers. Around Oranienstraße and Kottbusser Tor there is a wide range of shopping facilities and International restaurants. Supermarkets and retail stores supply convenience goods and those who prefer to go shopping in the noble shopping malls at the Potsdamer Platz and Friedrichstraße can drive there in only 10 minutes. The location is highly appreciated thanks to its good access to public transport: City-East within 15 minutes by car via Oranienstraße. Underground Kottbusser Tor is within 2 minutes of walk as well as several bus lines. Working and living in an inspiring and colourful environment – these things are perfectly combined at the GSG-Hof in the Adalberststraße in Berlin-Kreuzberg: enjoy Turkish specialties in the shops, or restaurants and bakeries in that area while all around the hip trend setters operate. The light-coloured clinker construction was built in 1859/1906 by the architect Wilhelm Hellwig. After a comprehensive renovation in 1992, five-storied buildings were added. 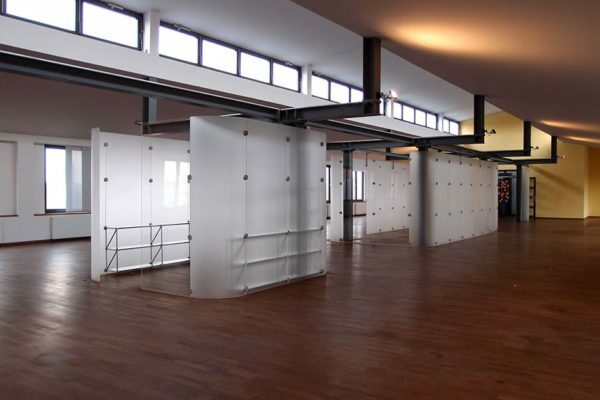 Today, the more than 33 rental units with 70 to 400 sqm are used as offices, lofts, commercial or workshops. Businessmen, trades people as well as creative people from architecture, film and fashion have established themselves here for a good reason: they value the neighbourhood because of its unconventional atmosphere. 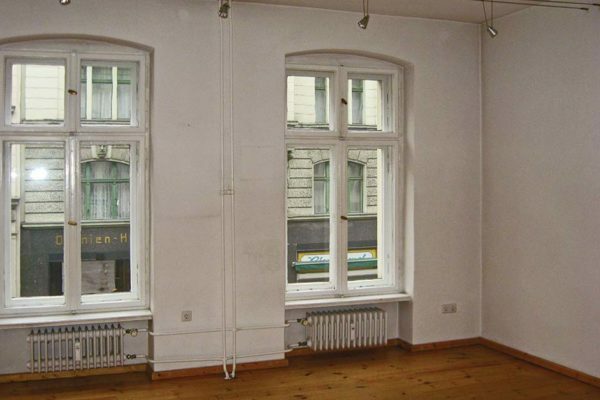 Today, many creative trades-people, film makers, artists and stylists, who enjoy and value the multicultural atmosphere, have their offices in the area around the Oranienstraße and the Kottbusser Tor. The numerous international cafés, restaurants and snack stands invite you to stop and stay a while. 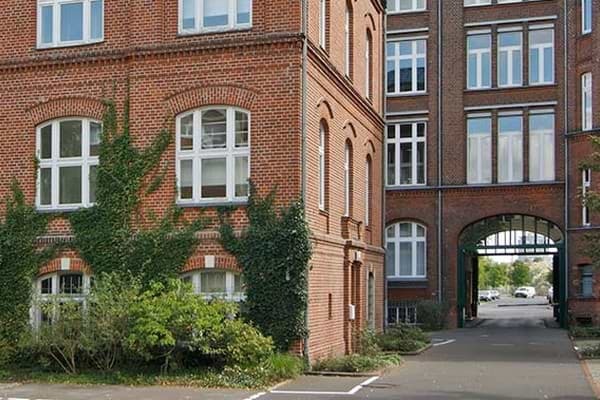 The buildings at Franklinstraße 27 were constructed on behalf of the Siemens AG between 1896 and 1898. 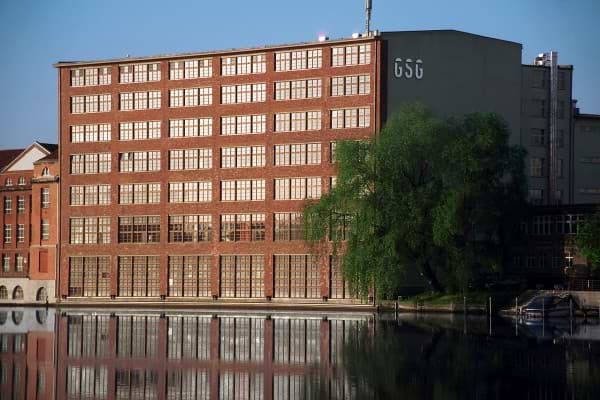 Later, the Osram GmbH acquired the complex and sold it to GSG in 1969. 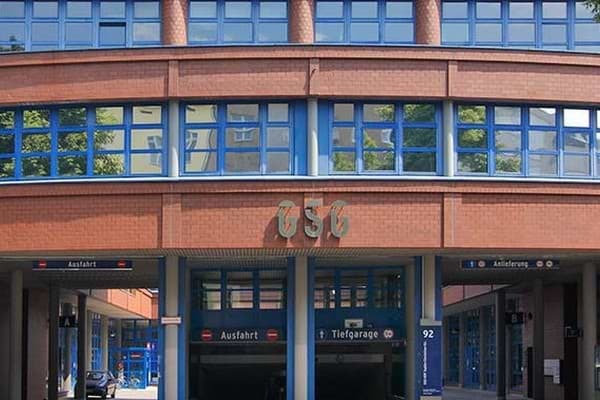 Between 1975 and 2016, it was the headquarters of GSG Berlin. Today, it is home to a communication agency and is listed as a protected building. 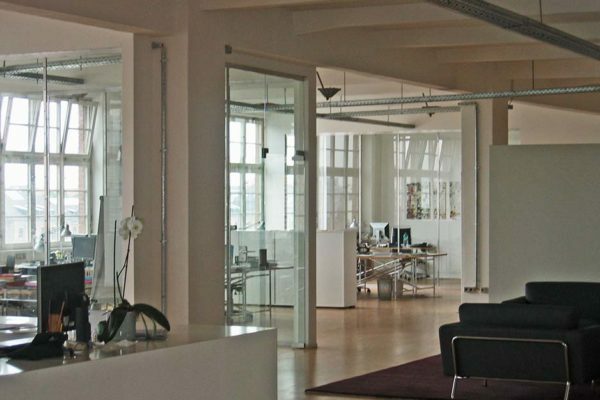 Today, Franklinstraße 27 is the premises of a communications agency. Well-known companies like the Volkswagen AG and the Fraunhofer Institute are situated in the immediate vicinity. Also the Technische Universität Berlin and the Universität der Künste are in the near vicinity. The Spree River is just a few meters away and invites you to linger during the lunch break. A symbiosis between working and living marks this part of Berlin-Charlottenburg where this GSG-HOF is located: to the west of the Klausenerplatz neighbourhood, between Kaiserdamm, Spandauer Damm, Königin-Elisabeth- and Schloßstrasse. The Charlottenburg Palace and the ICC exhibition center are nearby. Shopping facilities and restaurants are in Sophie-Charlotten-Straße and around Klausener Platz. DRK-Hospital at Spandauer Damm can be reached by car within 3 minutes. Airport Tegel can be reached by car within 8 minutes. Metrostation Sophie-Charlotte-Platz (Linie U2) and Tramway-Station Westend with access to the circular railway (Lines S41, S42, S46) are in walking distance. 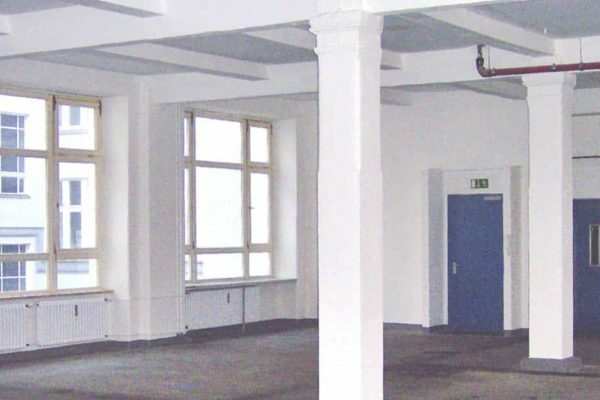 This industrial complex in Berlin is suited for small and medium sized businesses and originally was home to the Engelhardt-Brewery. 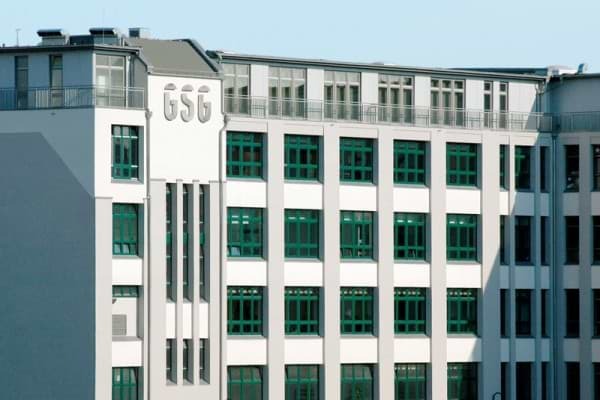 In 1990 GSG built this 10,000 sqm large red clinker building – a distinctive accent in the Sophie-Charlotten-Straße. This property has three inner courtyards with large delivery zones. 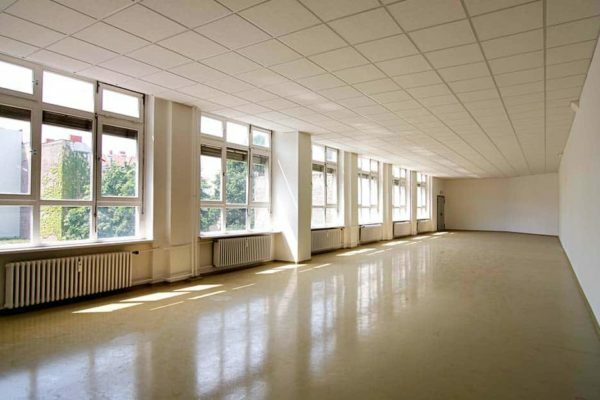 It is perfect for use as office or business premises, workshop or production facility. 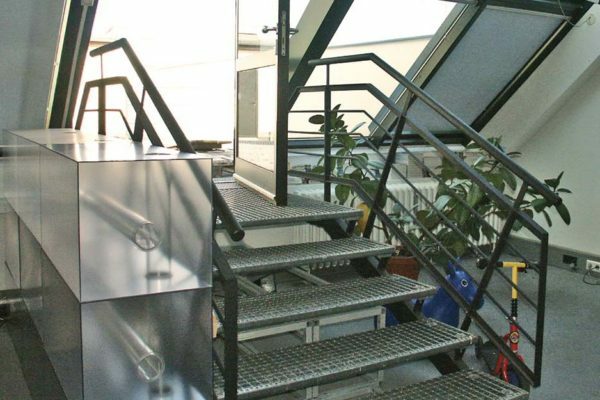 Customer services, office systems, electric plant construction as well as workshops with printing plants, laboratories with dental engineers and architects’ and engineers’ offices can be found in the 27 commercial units. Small and medium sized businesses from the fields of customer services, sales and services for office systems, printing plants, electric plant construction, dental engineering as well as architects’ and engineers’ offices are located in this industrial complex. Shopping facilities and restaurants can be found in the Sophie-Charlotten-Straße as well as around the popular Klausenerpatz with its public parks. 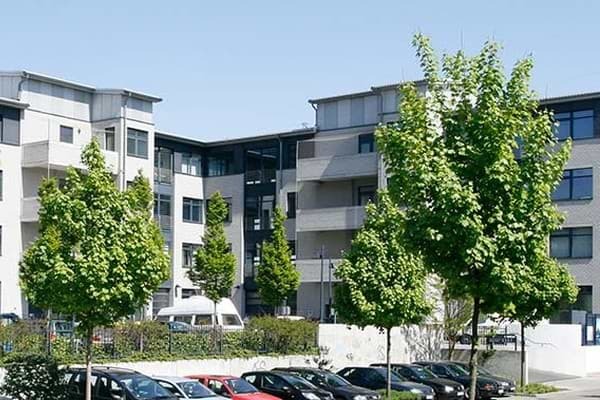 The Gebauer-Höfe are surrounded by an excellent infrastructure: The Technical University, various representative offices and banks are not far away. One main advantage of this location is the central location near 17. Juni-street, the central transport axis of Berlin. The Zoologischer Garten (the Berlin Zoo), Kurfürstendamm and the A100 Motorway can be reached within 5 minutes by car; Tegal Airport in 15 minutes by car. 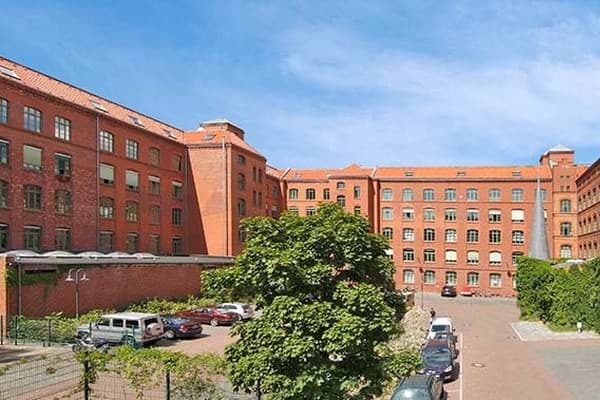 Constructed in the 19th century, in the characteristic commercial architecture style, the halls and buildings of the Gebauer-Höfe in Berlin Charlottenburg were once part of a textile and machine factory. 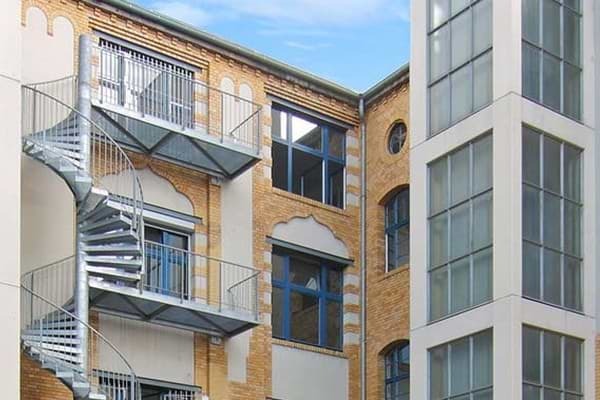 Today, the striking old buildings with their wide, historic clinker fronts have been complemented by two modern office buildings – a top property of the GSG, very close to the Ernst-Reuter-Platz. 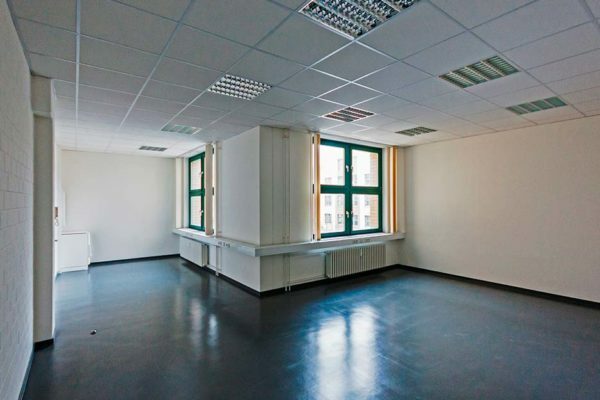 These office and commercial premises with four yards comprise 75 rental units with commercial areas ranging from 70 to 900sqm. They are suitable for offices, business premises, workshops or production uses. 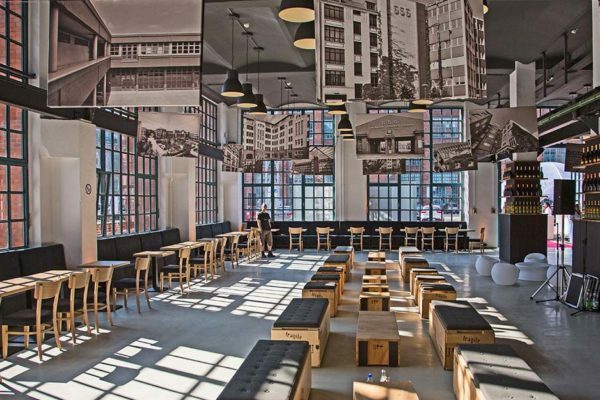 Very different companies have set up here – a fashion school, the Art Directors Club, a golf equipment shop as well as a bike shop, a coffee roasting house, lawyers and a beach bar. A special highlight of this building complex is the unique view to the Spree. 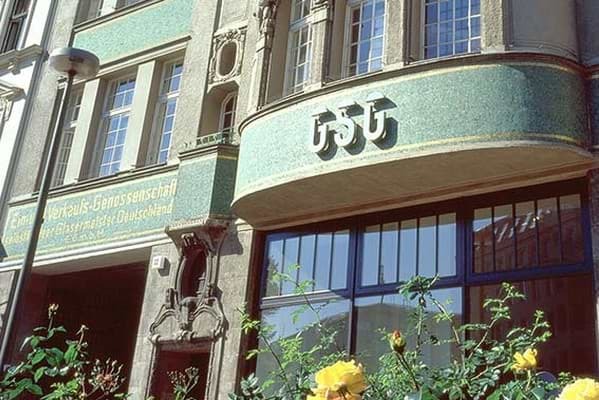 The Gebauer Höfe are surrounded by an excellent infrastructure: The Technical University, various representative offices and banks are not far away. On the site, there is a beach bar and a cafe, and in the nearby Helmholtzstraße, further cafes and restaurants offer coffee breaks and lunch. If you like, you can take a walk by the Landwehr canal or along the Spree River. 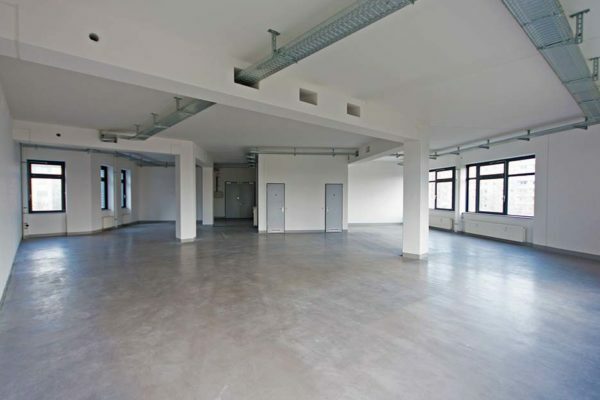 The commercial complex is located at a convenient location, close to the Ernst-Reuter-Platz in Berlin-Charlottenburg. There are bus stops for bus routes 101 and 245 outside the front door. Metro Stations at Ernst-Reuter-Platz and Turmstraße can be reached in about 5 minutes by bus. The Zoological Garden and the Kurfürstendamm can be reached in about 5 minutes drive from the commercial complex of GSG, the City East and the government district in 10 minutes by car. The A100 motorway links are within a 5 minute drive, Tegel Airport in 15 minutes by car. 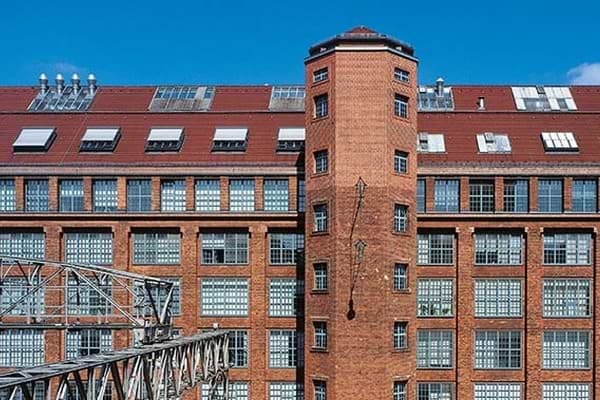 For connoisseurs of industrial architecture, the listed industrial complex with its five-story factory facade in the northeastern part of Berlin-Charlottenburg is a feast for the eyes. 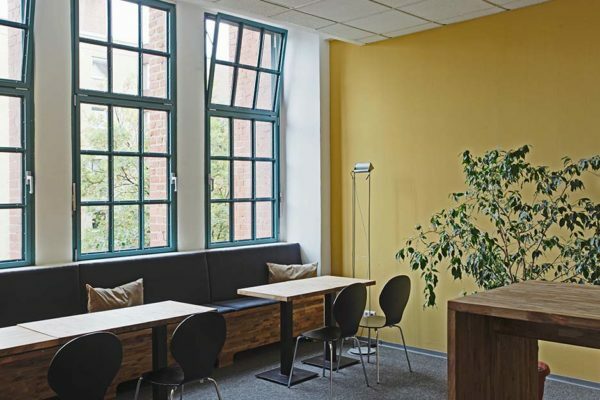 In the place where OSRAM once produced the world-famous light bulbs, young and innovative companies are now based. 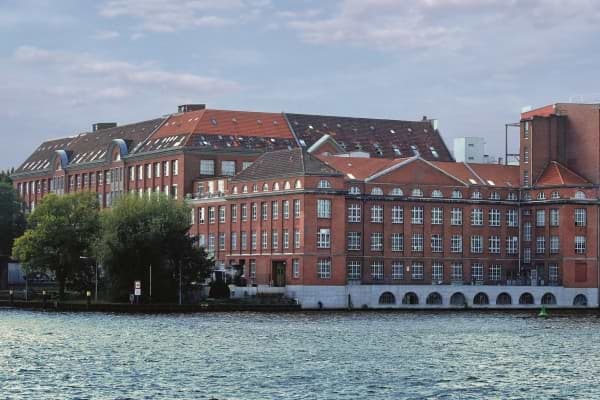 The red brick building situated between the river Spree and the Landwehr canal in Berlin-Charlottenburg was erected in 1898/1899 as a light bulb factory for Siemens & Haske. In 1919, the electric bulb company Auer Enterprise, which patented the OSRAM brand in 1906, merged with AEG and Siemens & Haske – and eventually became the company OSRAM, which was based right there. 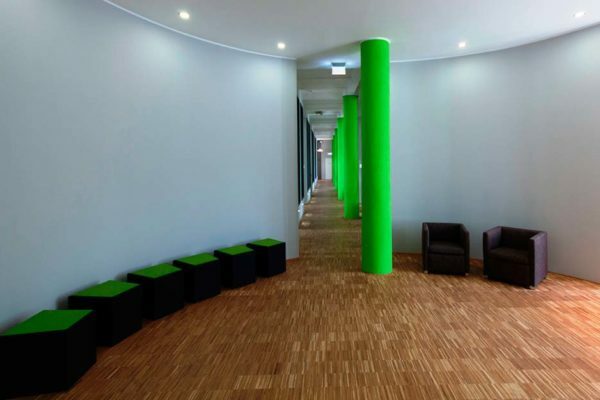 Today, the renovated GSG-Hof is situated in Campus Charlottenburg with its internationally significant research facilities. 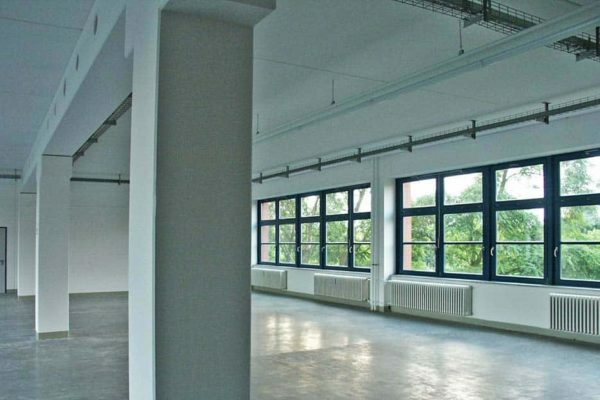 Office space, factory loft or commercial space – the areas offered range from 70 sqm for offices to about 730 sqm for commercial space. Companies from the business fields of telematics and IT application can obtaino offices at the “European Telematics Factory” (ETF). The competence center for the fields of mobility and mobility-related IT is located in the new building of the industrial complex. 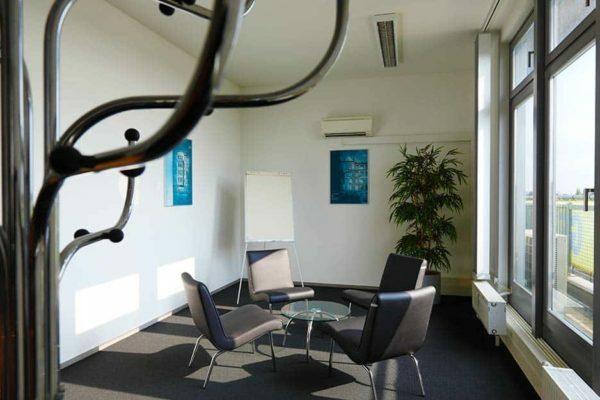 The service center located in the building offers a central reception and office services, as well as the possibility to rent workstations and conference rooms. Various businesses are located in the commercial property: from architecture, mail order trade and light measurement technology to dentistry. Well-known companies like the Daimler AG, Fraunhofer Institute, the research center of the Ingenieurgesellschaft Auto und Verkehr (IAV) as well as the innovation center of the Deutsche Telekom are situated in the immediate vicinity. 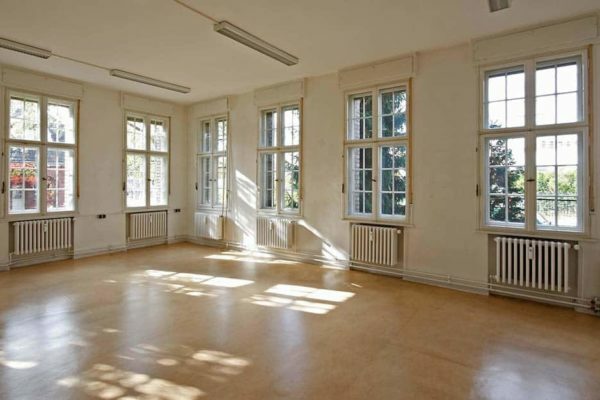 The property is located at the Campus Charlottenburg, in the immediate vicinity to the famous research facilities of the Technical University Berlin and the University of the Arts.